本发明公开了一种接收器，它包括用于接收节目流的装置和以本地存储的节目替换所述节目流的一些部分的装置。 The present invention discloses a receiver comprising means for receiving a program stream, and locally stored program to replace portions of the device program stream. 还描述了了本发明的其它方面。 Also described other aspects of the invention. 本发明提出了一种接收器/解码器、用于管理节目的装置、管理节目流的方法、管理程序的方法、控制接收器/解码器的方法、广播系统、消息、MPEG专用表、计算机程序产品、计算机可读媒体和信号。  The present invention provides a receiver / decoder, apparatus for managing programs, a method of managing a program stream, a program management method, the control of the receiver / decoder method, a broadcast system message, MPEG private table , a computer program product, computer-readable media and signaling. 它具体应用于个性化广告的广播和显示以及创建“虚拟”电视频道。 It finds particular application in personalized broadcast advertising and display, and create a "virtual" channels. 数字电视系统向观看者传送数字而非模拟形式的电视频道。  Digital television systems transmit digital form rather than analog TV channels to viewers. 数字频道在发送端编码成数字数据流，而在接收端利用数字接收器/解码器进行解码。 At the transmitting end digital channel encoded digital data stream, and decoding at the receiving end using a digital receiver / decoder. 为了实现交互性，可以通过传送电视频道的相同媒体或诸如电话链路之类的不同媒体来提供上行链路。 In order to achieve interactivity, an uplink may be provided via the same transmission media or different media channels, such as a telephone link or the like. 其它类型的数据，如数字音频、软件和交互数据可以被或也被广播。 Other types of data, such as digital audio, software and interactive data can be or are also broadcast. 此处所用的术语“数字电视系统”包括例如任何一种卫星、地面、电缆和其它系统。 As used herein, the term "digital television system" includes for example any satellite, terrestrial, cable and other system. 此处所用的术语“接收器/解码器”可以包含用于接收编码的或未编码的信号的接收器，这些信号例如电视和/或无线电信号，最好是MPEG格式的，可以被广播或以某些其它方式传送。  As used herein, the term "receiver / decoder" or may comprise means for receiving the encoded signal encoded by the receiver, the signals such as television and / or radio signals, preferably in MPEG format, can be broadcast or transmitted in some other way. 该术语还可以包含用于解码接收到的信号的解码器。 The term may further comprise a decoder for decoding the received signal to the. 此类接收器/解码器的实施例可包括与接收器集成的用于对接收到的信号解码的解码器，例如，“机顶盒”中与物理上分设的接收器配合而起作用的解码器，或者包括附加功能如Web浏览、视频录像或电视功能的解码器。 Example of such receiver / decoders may include integrated with the receiver for decoding the received signal decoder, e.g., "set top box" with a physically grouped to function with a receiver decoder, or decoder including additional functions such as Web browsing, video or TV functions. 术语MPEG指国际标准组织工作组“运动图像专家组”开发的数据传输标准，具体指(但不排除其它情况)针对数字电视应用开发并在文档ISO 13818-1、IS013818-2、IS013818-3和ISO 13818-4中阐述的MPEG-2标准、以及MPEG-4和其它设想的MPEG标准。  The term MPEG refers to the data transmission standards ISO Working Group developed "Motion Pictures Expert Group" refers to the specific (but not exclusively,) developed for digital television applications and documents ISO 13818-1, IS013818-2, IS013818 3 and MPEG-2 standard set forth in ISO 13818-4, and the MPEG standard, MPEG-4 and other contemplated. 就本专利申请的范围而言，该术语包括适用于数字数据传输领域的MPEG格式的所有变型、改进或发展形式。 In terms of ranges all modifications of the present patent application, the term includes for digital data transmission field of the MPEG format, or the development of improved form. 数字电视系统通常具有如下特征:具有大量(通常数百个)以音视频为主的频道，用户可以随意(受限于所获得的各频道的相关访问权)浏览和观看各频道。  Digital television systems typically have the following characteristics: a large number (typically hundreds) with audio and video-based channel, users can (subject to the relevant access rights of each channel obtained) browsing and viewing various channels. 因此随时可以观看的资料范围很宽，这允许用户在一定程度上实现定制观看。 Therefore, the scope of information that can be viewed at any time is very wide, which allows users to implement custom view to a certain extent. 但是，跟踪所有可用资料、根据个人口味对资料精确地进行分类以及调度感兴趣的节目超出了大多数用户的能力或爱好。 However, tracking all the available data, according to personal taste to classify data accurately and scheduling programs of interest beyond the ability of most users or hobby. 此外，通常只有较少比例的观众对广播广告感兴趣，但广播广告却是广告商的主要的且常常是至关重要的收入来源。  In addition, usually only a minor proportion of the audience interested in radio advertising, radio advertising, but it is a major and advertisers often crucial source of income. 但是在大多数常规数字电视系统中，即便使广告针对目标观众并非不可能，但也常常是困难而且低效率的。 However, in most conventional digital television system, even if the advertising target audience is not impossible, but it is often difficult and inefficient. 美国专利5848397中描述了一种调度到电子邮件用户的广告播放的方法。  U.S. Patent No. 5,848,397 describes a mail user to schedule ad play method. 服务器系统具有广告分发调度装置，它根据驻留在服务器系统上的数据库管理系统中存储的人口统计信息使广告针对特定用户。 The server system has an advertisement distribution scheduler means, so that advertisement for a specific user according to demographic information database management system resident on the server system is stored. 在客户系统上将下载的广告存储在广告队列中。 In the ad on the client system to download queue stored in the ad. 队列中的广告位置由服务器系统先前分配给该广告的优先级来决定。 Queue ad slot previously assigned by the server system to the priority of the advertisement is determined. 然后依次将队列中的广告呈现给用户。 Then turn in the queue advertisement presented to the user. 在美国专利5848397中所述的系统中，有必要获得人口统计信息并将其集中存储在服务器系统上。  In the system described in U.S. Patent No. 5,848,397, it is necessary to obtain demographic information and stored on a centralized server system. 为此，要求用户在首次访问客户系统时完成调查表或提交成员简档。 To this end, it requires users to complete a questionnaire submitted to member profile or when you first visit the client system. 为了使广告针对选定的用户，美国专利5848397中所述的服务器系统通过采用“点到点”传输协议而仅将选定的广告传送到各客户系统。  In order for advertising to selected users, U.S. Patent No. 5,848,397 in the server system through the use of "point to point" transmission protocol and only the selected advertisement is transmitted to each client system. 美国专利5740549中描述了另一种信息和广告分发系统及方法。  In U.S. Patent No. 5,740,549 describes another information and advertising distribution system and method. 在优选实施例中，局域网(LAN)服务器将所有的新闻项目下载到本地数据库。 In a preferred embodiment, a local area network (LAN) server downloads all news items into the local database. 多个预订用户连接到该LAN服务器，每个预订用户拥有它自己的用户简档。 Multiple bookings users to connect to the LAN server, each subscribing user has its own user profile. 每个预订用户运行屏幕保护程序。 Each subscription user to run a screen saver. 屏幕保护程序滤去LAN服务器的本地信息数据库中与每个预订用户的用户简档不相符的新闻项目，从而只向每个预订用户显示对应于该预订用户的用户简档的新闻项目子集。 News items local information database screen saver filtered LAN server and each user profile does not match the user's book, which shows only user to each subscriber to a subset of news items corresponding to the subscription user's user profile. 在独立预订用户的计算机中，过滤新闻报道是在数据下载过程中通过只下载该预订用户的用户简档所对应的新闻项目来完成的。 In a separate computer reservation users, the filter is done by news reports news items only to download the book user's user profile corresponding to the data download process. 本发明试图解决上述现有技术中遇到的问题。  The present invention seeks to solve the above problems encountered in the prior art. 因此，本发明的第一方面提供了一种用于接收和解码节目流的接收器/解码器，它包括:用于存储多个节目的装置(例如，海量存储设备)，用于根据用户简档选择所存储的节目之一的装置(例如处理器和相关的存储器)，以及用于以所选定的节目替换节目流的一些部分的装置(例如，相同的或不同的处理器和相关存储器和/或输出)。  Accordingly, a first aspect of the present invention provides a method for a receiver / decoder for receiving and decoding a program stream, comprising: means for storing a plurality of programs (e.g., mass storage devices) are used for one of the user profile to select a stored program means (e.g., processor and associated memory) according to, and means for replacing portions of the program stream to the selected program (e.g., the same or different processor and associated memory and / or output). 这可以在整体上实现更大的灵活性，具体来说通过仅在需要时利用用户简档选择节目(此类计算可能非常复杂)而实现更高的效率。  This enables greater flexibility on the whole, specifically select a user profile by using the program only when needed (such calculations can be very complex) to achieve higher efficiency. 此外，因为可不加区别地存储多个节目，所以即使存储多个节目之后用户简档发生变化，仍可以选中相关的节目。 In addition, because multiple programs can be stored indiscriminately, even after a brief program to store multiple user profile changes, you can still select the relevant program. 此处所用的术语“节目”最好包含音频/可视内容或其它内容，如通常向接收器/解码器广播的内容。  As used herein, the term "program" preferably includes an audio / visual content or other content, such as generally content to the receiver / decoder broadcast. 新闻报道、电影、广告、字幕字符串、网络直播(webcast)、网络摄像(webcam)以及电台广播均是这种意义上的节目实例。 News, movies, advertisements, subtitles string webcast (webcast), web camera (webcam) and radio programs are examples in this sense. 这里所用的术语“音频/可视内容”最好包含音频或可视资料或二者的组合。 As used herein, the term "audio / visual content" preferably include an audio or visual information or a combination of both. 就接收器/解码器接收的广播信号的范围而言，此术语可以涵盖字幕、图文电视、同步信号以及其它与构成电视节目的音频和视频元素密切相关的传输数据。 In terms of ranges broadcast signal receiver / decoder reception, this term may encompass subtitle, teletext, synchronization and other data transmission signal is closely related to the audio and video elements constituting the television program. 接收器/解码器最好还包括用于从单个通信信道(最好是与承载节目流的信道相同的通信信道)接收多个节目的装置(例如接收器)。  The receiver / decoder preferably further comprises means (e.g., receiver) receives a plurality of programs from a single communications channel (the same channel with the best communication channel carrying program stream) is used. 通信信道可以是常规的多媒体传送系统，例如有线、卫星或地面电视系统、但也可以是因特网或任何其它可以传送数字(或甚至模拟)数据的网络连接。 The communication channel may be a conventional multimedia delivery systems, such as cable, satellite or terrestrial television system, but also may be the Internet or any other number may be transmitted (or even analog) data network connection. 这可使接收器/解码器更易于构建。 This allows the receiver / decoder easier to build. 同样地，当然可以在不同的信道上接收多个节目，要么彼此相关，要么与节目流有关。  Similarly, of course, you can receive a plurality of programs on different channels, or related to each other, or associated with a program stream. 在此情况下，同样可以同时接收多个彼此相关或与节目流有关的节目。 In this case, the same can simultaneously receive a plurality of programs related to each other or relating to the program flow. 接收器/解码器可能还包括按周期性的预定时间间隔接收多个节目的装置(例如相同的或其它的接收器)，据此可以提高系统的可靠性。  The receiver / decoder may further comprise means (e.g., the same or other receivers) periodically at predetermined time intervals received plurality of programs, whereby the system reliability can be improved. 具体来说，可以提供事件模块(例如处理器和相关存储器)以确保接收多个节目。 Specifically, the event module may be provided (e.g., processor and associated memory) to ensure that the plurality of received programs. 此外，接收器/解码器最好还包括:用于维护用户简档的装置(例如处理器和相关存储器)、用于根据用户简档选择节目的装置(例如处理器和相关的存储器)以及用于输出节目的装置(例如输出)；用于选择节目的装置适于响应输出节目的请求而进行操作。  In addition, the receiver / decoder preferably further comprises: means (e.g., a processor and associated memory) for maintaining a user profile, the user profile for the device according to the selected program (e.g., processor and associated memory ) and means for outputting the program (e.g., output); means for selecting a program adapted to operate in response to a request for output of a program. 请求可以采用“外部”请求的形式，例如用户按遥控上的按钮来切换频道，或者可以是“内部”请求，例如接收器/解码器内装置之间进行的通信。 The request may take the form of "external" request, for example, the user presses a button on the remote control to switch the channel, or may be an "internal" request, for example, communication between devices in the receiver / decoder. 该请求还可以为事件，例如特定计算机代码段的执行，指示需要选择另一节目。 The request may also be an event, such as executing specific computer code segments, indicating the need to select another program. 这可进一步提高系统的效率，仅在需要时进行基于用户简档的选择也具有这种优点。 This may further improve the efficiency of the system, selected based on the user profile also has the advantage that only when needed. 相比之下，假设例如用户简档在节目时间表期间有变更，则制定了完整的节目时间表且随后予以遵守的系统可能就会缺乏灵活性。 In contrast, for example, assume that a user profile during the program schedule has changed, the development of a complete program schedule and then it will be possible to comply with the system inflexible. 尽管如此，本发明仍可以用于创建多个节目的时间表。 Nevertheless, the present invention can still be used to create multiple schedule of programs. 此重要特征也是独立提供的。  This important feature is also provided independently. 因此，在本发明的另一个方面，提供了一种接收器/解码器，这种接收器/解码器包括:用于维护用户简档的装置(例如处理器和相关存储器)、用于根据用户简档选择节目的装置(例如处理器和相关的存储器)以及用于输出节目的装置(例如输出)；用于选择的装置适于响应输出节目的请求而进行操作。 Thus, in another aspect of the present invention, there is provided a receiver / decoder, the receiver / decoder comprising: means (e.g., a processor and associated memory) for maintaining a user profile for the user a program profile selection means (e.g., processor and associated memory) and a device (such as an output) for outputting a program; and means for selecting is adapted to operate in response to a program request output. 用于选择节目的装置可经调整以适于在选择第一节目之后选择另一节目，还可经调整以适于在输出第一节目期间选择另一节目。 Means  for selecting a program can be adapted to be adjusted to select another program after selecting a first program, it may also be adjusted to further adapted to select a program during the output of the first program. 例如，如果用户简档随时间快速变化，这就能够迅速地建立相应的用户配置。 For example, if the user profile is rapidly changing with time, which makes it possible to establish the appropriate user configuration quickly. 按这种方式选择节目，就可以免去维护预定节目的“播放列表”。 In this way a program is selected, you can remove scheduled maintenance program "Playlist." 在本发明的一个相关方面，提供了一种在接收器/解码器上管理节目流的方法，包括:存储多个节目，根据用户简档选择所存储的节目之一以及以所选定的节目替换节目流的一些部分。  In a related aspect of the present invention, there is provided a method of managing a program stream at the receiver / decoder, comprising: storing a plurality of programs, the user profile according to one of the programs selected and stored in the selected given program to replace some portion of the program stream. 该方法最好还包括将多个节目通过单个通信信道发送到接收器/解码器。 The method preferably further comprises a plurality of programs to the receiver / decoder over a single communications channel. 该方法还可以包括按周期性的预定时间间隔发送多个节目，此外最好还包括当较少电视频道在广播时，通过电视广播系统发送多个节目。  The method may further comprise transmitting a plurality of programs by a predetermined periodic intervals of time, furthermore preferably includes less when broadcast TV channels, a plurality of programs transmitted by television broadcasting system. 所述时间可以是，例如临晨2点和4点之间或临晨3点和5点之间，预定业务需要较少带宽的时候。 The time may be, for example, Pro morning between 4:00 and 2:00 or 3am and 5:00, the predetermined time traffic requires less bandwidth. 该方法最好还包括维护用户简档、根据用户简档选择节目以及输出节目；所述选择节目的步骤响应输出节目的请求来执行。  Preferably, the method further includes maintaining a user profile, select a program according to a user profile and an output program; performed in response to a program request output step of selecting a program. 在本发明的另一相关方面，提供了一种控制接收器/解码器的方法，包括:维护用户简档、根据用户简档选择节目以及输出节目；选择节目的步骤相应于输出节目的请求而执行。  In another related aspect of the invention there is provided a decoder, comprising controlling a receiver /: maintaining a user profile, select a program according to a user profile and an output program; the step of selecting a program corresponding to the program output the request is executed. 该方法最好还包括在输出节目期间选择该节目之后的另一节目。 Preferably, the method further comprising selecting another program after the program during the output of the program. 计算机程序产品还可以包括用于维护用户简档的装置、用于根据用户简档选择节目的装置以及用于输出节目的装置；用于选择节目的装置适于响应输出所述节目的请求而进行操作。  The computer program product may further comprise means for maintaining a user profile, a user profile and means for selecting a program according to the program output; means for selecting a program adapted to respond to the output of the program request operation. 在本发明的再一个相关方面，提供了一种计算机产品，包括:用于维护用户简档的装置、用于根据用户简档选择节目的装置以及用于输出节目的装置；所述用于选择的装置适于响应输出所述节目的请求而进行操作。  In a further related aspect of the present invention, there is provided a computer product, comprising: means for maintaining a user profile, means for selecting a program according to a user profile, and means for outputting the program for; the means for selecting is adapted to perform the operation in response to the output request of the program. 所述用于选择节目的装置可经调整以适于在选择第一节目之后选择另一节目，可经调整以适于在输出所述第一节目期间选择所述另一节目。 Means for selecting a program can be adapted to be adjusted to select another program after selecting a first program, may be adjusted to further adapted to select the output of the first program during the program. 在本发明的另一个相关方面，提供了一种接收器/解码器，包括:用于接收节目流的装置(例如，接收器)以及用于以本地存储的节目替换节目流的一些部分的装置(例如，处理器及相关存储器和/或切换装置)。  In another related aspect of the present invention, there is provided a receiver / decoder, comprising: means for receiving a program stream (e.g., a receiver) and a locally stored program for replacing some of the program stream means (e.g., processor and associated memory and / or switching means) moiety. 通过以本地存储的节目替换节目流的一些部分，可以由接收器/解码器本身来提供定制的节目调度。  By replacing portions of the program stream to a locally stored program may be provided by the customized program schedule receiver / decoder itself. 该接收器/解码器最好包括用于接收适合于一定范围的用户的多个节目的装置(例如，接收器)以及用于从多个节目中选择适合于所述用户中的至少一个用户的至少一个节目的装置(例如，处理器及相关存储器)。  The receiver / decoder a plurality of programs preferably comprises means (e.g., receiver) and means adapted for receiving a user selection of a range appropriate to the user from the plurality of programs at least at least one program means a user (e.g., processor and associated memory). 所述用户或每个用户最好与接收器/解码器相关联。 The user or each user is preferably associated with the receiver / decoder. 通过从多个节目进行选择，就可以实现用户定制。  by selecting from a plurality of programs, customization can be achieved. 因为节目在输出之前不需要存储，所以还以独立方式来实现此重要特征。 Because the program need not be stored prior to output, in an independent manner so it is important to implement this feature. 因此，在一个相关方面，提供了一种接收器/解码器，包括:用于接收适合于一定范围的用户的多个节目的装置(例如，接收器)以及用于从多个节目中选择适合于所述用户中的至少一个用户的至少一个节目的装置(例如，处理器及相关存储器)。  Accordingly, in a related aspect, there is provided a receiver / decoder, comprising: a plurality of program means (e.g., receiver) receives adapted for a range of users from a plurality of programs and a at least one of the at least one program selected for the user device to the user (e.g., processor and associated memory). 如前所述，所述用户或每个用户最好与接收器/解码器相关联。 As described above, the user or each user is preferably associated with the receiver / decoder. 所述节目或每个节目可以是广告。 The  Each program may be a program or advertisement. 广告本质上是最短类型的节目，通过处理广告可以简化节目的操作，因为处理广告只需较少容量(带宽或存储量)等。 Advertising is essentially the shortest type of program, the operation can be simplified by processing program advertisement, advertisement because the processing requires less capacity (bandwidth or storage) and the like. 此外，因为广告具有针对性，故选择过程较为重要。 In addition, because targeted ads, so the selection process is more important. 接收器/解码器还可以包括用于存储多个节目的装置(例如，海量存储设备)。  The receiver / decoder may further comprise means (e.g., mass storage device) for storing a plurality of programs. 通过存储多个节目，可以在各种时间创建定制内容，而不仅在将多个节目广播或以其它方式传送到接收器/解码器时。 By storing a plurality of programs, customized content can be created at various times, and not just when the plurality of programs broadcast or transmitted to the receiver / decoder when otherwise. 接收器/解码器最好还包括用于输出所述节目或每个节目的装置(例如输出)。  The receiver / decoder preferably further comprises means for outputting the or each program, the program means (e.g., output). 此类装置可以是例如MPEG解码器、图形引擎、电视调制器和/或物理连接。 Such means may be, for example, an MPEG decoder, graphics engine, television modulator, and / or physical connections. 因此，可以增强接收器/解码器的独立定制能力。 Accordingly, the customization capabilities can be enhanced independently of the receiver / decoder. 接收器/解码器还可以包括用于从存储器中删除所述存储的多个节目中未被选择以供输出的至少一个节目的装置(例如，处理器及相关存储器)。  The receiver / decoder may further comprise means for at least one program (e.g., processor and associated memory) for outputting a plurality of said stored programs to delete from the memory is not selected. 例如，如果在特定时限到期之后所述节目或每个节目，则可将其删除，条件是它们不满足某种“期望”标准，有新节目到达或这两种条件同时成立。  For example, if the program or each program after a certain time limit expires, you can delete it, provided that they do not meet certain "expectation" standard, there are new programs to reach or both conditions are true. 这可以释放接收器/解码器内的宝贵的存储空间，并使所述节目或每个节目可为所需的可能更新且更适合的节目所替换。  This frees up valuable storage space within the receiver / decoder, and the programs or each program may be possible to update the program required more suitably replaced. 通常，任何时候均在存储器中保存50个节目，其中任何新节目将首先替换最不想要的节目。 In general, any time saved 50 programs in memory, any new program will be the first program to replace most do not want. 或者，向上可以存储多于100、200、500或1000个节目。 Alternatively, more than 100,200,500, or may be stored up 1000 programs. 接收器/解码器还可以包括用于从广播比特流中提取多个节目的装置(例如解码器)。  The receiver / decoder may further comprise means for extracting a plurality of programs from a broadcast bit stream (e.g. the decoder). 同样地，也可以通过其它装置来接收多个节目，例如通过因特网连接和/或广播电缆连接。 Similarly, a plurality of programs may also be received by other means, for example by an Internet connection and / or cable broadcasting. 这可以简化向多个接收器/解码器提供定制内容的步骤，因为可能无需将定制内容以点到点的方式传送到接收器/解码器。 This can simplify the step of providing customized content to a plurality of receiver / decoder may not need to be customized content as point to point manner to the receiver / decoder. 在一个实施例中，接收器/解码器还适于在第一传输时隙期间接收多个节目，而在第二传输时隙期间输出所述节目。  In one embodiment, the receiver / decoder is further adapted to receive a plurality of programs during a first transmission slot, and output during a second transmission slot of the program. 第一传输时隙最好在预定时间出现。  The first transmission slot preferably occurs at a predetermined time. 这种预定时间可以为例如临晨2时和4时之间。 This predetermined time may be between Example 2 and 4 when immersive morning. 这样可在“多余的”(或至少便宜的)带宽可用时向接收器/解码器广播多个节目。 This "excess" (or at least cheap) bandwidth is available the receiver / decoder a plurality of programs to broadcast on. 第二传输时隙可以为广播频道期间的节目间断期(synchronized programbreak)。  The second transmission slot may be intermittently period (synchronized programbreak) for the program during the broadcast channel. 或者它可以与预定节目等效，如定期的半小时时隙或延长的电影时隙。 Or it may be equivalent to a predetermined program, such a regular half-hour slot or extended film slot. 此处所用的术语“节目中断”最好包含例如给定电视频道上预定节目之间的任何间歇期，例如广告间歇期。 As used herein, the term "program interrupt" preferably includes, for example of a predetermined interval between any programs on a given television channel, such as intermittent advertising. 第一传输时隙和第二传输时隙可以有效地同时发生,对应于“现场”广播的场合，其中接收器/解码器向用户提供直播“虚拟频道”。  The first transmission slot and the second transmission slot may effectively occur simultaneously, corresponding to a "live" broadcast of the case, wherein the receiver / decoder provides a live 'virtual channel' to the user. 这可能需要较快的处理来选择节目，但可能不需要存储多个节目。 This may require faster processing to select a program, but may not need to store multiple programs. 最好，接收器/解码器还包括用于接收指示必须为第二传输时隙选择节目的消息的装置(例如接收器)，最好还包括用于处理消息的装置(例如，处理器及相关存储器)。  Preferably, the receiver / decoder further comprises means for receiving a transmission slot indicating a second message of the selected program (e.g., a receiver) must, preferably further comprising means for processing a message (e.g., the processing and associated memory). 可以在广播节目流中接收消息，消息最好包括与所述第二传输时隙相关的定时信息。  The message may be received in the broadcast program stream, preferably comprising a message timing information associated with the second transmission slot. 这提供如下优点:可以利用发送到接收器/解码器的消息从例如广播中心来遥控定制过程。 This provides the following advantages: the use of a message can be transmitted to the receiver / decoder to the broadcast center, for example, from the remote customization process. 此外，该消息最好包含期望的节目种类或类型。  Additionally, the message preferably comprises a desired program genre or type. 此种类或类型可以是节目的类别，例如新闻、体育或电影；或给定类别下的特定类型，例如恐怖电影或与健康保健相关的广告。 This species can be category or type of program, such as news, sports or movies; or a particular type in a given category, such as horror movies or associated with health care advertising. 指定例如待选广告类型的其它消息可以结合特定的节目频道和/或结合特定的时间或日期范围来传送，而不是加到特定时隙上。 Other messages specifying, for example be selected from the advertisement specific type of program channels may be combined on and / or in conjunction with a specific time or date range to transmit, rather than applied to a particular time slot. 通过在消息中包含必须为给定时隙选择节目的指示以及指明期望的节目种类或类型，可以使由外部实体(例如广播中心)到接收器/解码器的数据传输更有效率。 Comprising a program must be selected by indicating for a given time slot in the message and indicating the desired program genre or type, the data transmission can be made more efficient by an external entity (e.g., a broadcast center) to the receiver / decoder. 接收器/解码器最好包括用于维护用户简档的装置(例如，处理器及相关存储器)，它可以改进针对用户品味进行的节目定制。  The receiver / decoder preferably includes means (e.g., processor and associated memory) for maintaining a user profile, which can improve the taste for a program tailored to the user. 所述简档最好与接收器/解码器的用户相关联。 Preferably the receiver / decoder associated with the user profile. 或者，所述简档可以与接收器/解码器中的预订或其它智能卡的拥有者相关联。 Alternatively, the profile may be associated with the owner of the receiver / decoder subscription or other smartcard. 接收器/解码器最好还包括用于接收与多个节目中的各个节目相关联的控制数据的装置(例如，接收器)。  The receiver / decoder preferably further comprises means for receiving control data of each of the plurality of programs associated with the program (e.g., a receiver). 接收器/解码器最好适于基本同时接收多个节目和控制数据。 The receiver / decoder is preferably adapted to substantially simultaneously receive a plurality of control programs and data. 此夕卜，与每个节目个体相关联的控制数据最好间插在各个节目之间；最好采取包含单个节目及相关控制数据的单一数据块的形式，在接收器/解码器中这种数据通常需要较少的存储器。 Bu this evening, the control data associated with each individual program is preferably interleaved between each program; preferably take the form of a single data block containing a single program and related control data, which the receiver / decoder data typically requires less memory. 或者，所有控制数据可以在一个数据块中一次接收，并可以概括说明多个节目，而不是一对一地说明各节目。 Alternatively, all of the control data may be received at a first data block and a plurality of programs may be general description, rather than one to one description of each program. 接收器/解码器最好还适于根据接收到的控制数据选择节目，从而提高从接收器/解码器外进行定制处理的可控性。  The receiver / decoder is preferably further adapted to select a program according to the received control data, thereby improving the controllability of the customization process from outside the receiver / decoder. 控制数据最好包含简档数据，而接收器/解码器还包括用于选择其相关简档数据严密匹配某个或所述用户简档的节目的装置(例如，处理器及相关存储器)。  The control data preferably comprises profile data, and the receiver / decoder further comprises means (e.g., processor and associated memory for selecting its associated profile data closely matches a or the program's user profile ). 这可以减少所显示的用户不感兴趣的节目的数量，从而可以提高系统效率。 This may reduce the number of programs displayed the user is not interested in, which can improve system efficiency. 接收器/解码器可以包括用于调整至少部分用户简档的装置(例如，处理器及相关存储器)，最好采用配置应用的形式。  The receiver / decoder may comprise means (e.g., processor and associated memory) for adjusting at least part of the user profile, preferably in the form of a configuration application. 用户可以指定多个特定兴趣(例如，体育等)的相对偏好。 The user can specify a plurality of specific interest (e.g., sports, etc.) relative preference. 这允许用户根据他或她的个人品味来定制节目，例如广告。 This allows the user to customize the program according to his or her personal taste, such as advertising. 最好，接收器/解码器还适于根据期望的节目种类或类型来选择节目。  Preferably, the receiver / decoder is further adapted to select the program in accordance with a desired program genre or type. 或者，可以根据用户和/或接收器/解码器的特征来选择节目。 Alternatively, a program may be selected according to the characteristics of the user and / or receiver / decoder. 此类参数可以是例如用户的预订组或地理位置。 Such parameters may be, for example, the user's subscription group or geographical location. 该接收器/解码器可以包括用于接收第二多个节目的装置(例如，接收器)以及用于从所述第二多个节目中选择第二节目的装置(例如，处理器及相关存储器)。  The receiver / decoder may comprise means (e.g., a receiver) for receiving a second plurality of programs and for selecting a second device from the second object of the plurality of programs (e.g., processors and associated memory). 最好，接收器/解码器还包括用于输出所述第二节目的装置(例如输出)和/或按传输时隙调度选定的第一和第二节目的装置(例如，相同的或另外的处理器及相关存储器)。 Preferably, the receiver / decoder further comprises and / and the second destination device (e.g., the same or scheduled transmission time slot or by further selected first object for outputting said second means (e.g., output) the processor and associated memory). 这允许进行“虚拟频道”操作。 This allows "virtual channel" operation. 最好，接收器/解码器还包括用于接收与第二多个节目相关联的控制数据的装置(例如，接收器)；最好根据所述相关控制数据来选择第二节目。  Preferably, the receiver / decoder further comprises a second plurality of means for receiving control data associated with the program (e.g., a receiver); a second program is preferably selected in accordance with the relevant control data. 接收器/解码器可经调整以适于在所述第一节目结束时或之后选择所述第二节目。  The receiver / decoder may be adapted to be adjusted to select the second program at or after the end of the first program. 如上所述，这可以帮助实现“即时”计算节目选择的灵活系统，从而实现无需本地存储即可工作的现场直播“虚拟频道”。 As mentioned above, this flexible system can help achieve "instant" calculation program selection, enabling local storage without having to live to work "virtual channels." 该接收器/解码器最好还包括利用节目顺序规则计算所述第二多个节目相对于所述第一节目的兼容性等级的装置；并且还适于选择兼容性等级高的节目。  The receiver / decoder preferably further comprises using program sequence rules of the second plurality of program means calculates said first level with respect to the compatibility purposes; and further adapted to select a high level of compatibility of a program . 这就可能允许实现更强大的定制功能，例如跟踪输出过的节目的历史，并相应地调整输出。 This may allow for a more powerful customization features, such as tracking output over the history of the program, and adjust the output accordingly. 此重要的特征也可单独提供。  This important feature may be provided separately. 因此，在本发明的相关方面，提供了一种接收器/解码器，它包括:用于从第一多个节目中选择第一节目的装置(例如，处理器及相关存储器)，以及用于根据所述第一节目所用节目顺序规则从第二多个节目中选择第二节目的装置(例如，相同的或另外的处理器和相关存储器)。 Accordingly, in a related aspect of the present invention, there is provided a receiver / decoder, comprising: means for selecting a first destination device (e.g., processor and associated memory) from a first plurality of programs, and means for the first program is the program sequence rules to select a second destination device (e.g., the same or a further processor and associated memory) from the second plurality of programs used. 节目顺序规则可以限制指定时限内特定类型或种类的节目的重复次数。  The program sequence rules may limit the number of repetitions within the designated particular type or class of program. 因此，这些规则可以防止例如将竞争对手的汽车品牌广告相继地播放给用户。 Therefore, these rules can prevent competitors such as the car brand advertising have played to the user. 或者，这些规则可以指定例如给定时限内需要呈现的广告或新闻报道的最低数量。 Alternatively, these rules may specify the minimum number required within a given time frame presented in advertising or news coverage, for example. 这些节目顺序规则还可以指定节目种类或类型的最佳组合和/或序列。  The program sequence rules may also specify the best combination of program genre or type and / or sequence. 因此，例如，可以有指定广告应该在电影之前和之后播放的节目顺序规则。 Thus, for example, you can have a program sequence rules should specify the ad played before and after the movie. 接收器/解码器最好还包括用于在接收器/解码器接收包含至少部分节目顺序规则的消息的装置(例如，接收器)。  The receiver / decoder preferably further comprises means for a receiver / decoder comprising receiving at least a portion of the program sequence rules of the message (e.g., a receiver). 这可以提供更方便的方式来定制向用户提供“虚拟频道”，而无需接收器/解码器的任何数据。 This can provide a more convenient way to customize the "virtual channel" to users, without having any data receiver / decoder. 接收器/解码器最好适于接收作为广播比特流的一部分的消息，但也可经调整以适于通过其它方式来接收消息，例如通过因特网的点到点连接。 The receiver / decoder is preferably adapted to receive messages as part of a broadcast bit stream, but may also be adapted to be adjusted by other means received message, for example via an internet connection point to point. 接收器/解码器可以包括用于以接收到的新节目顺序规则替换至少部分原节目顺序规则的装置(例如，处理器及相关存储器)。  The receiver / decoder may comprise a regular sequence of received new program replacing apparatus (e.g., processor and associated memory) at least part of the original program sequence rules. 这允许以动态和可更新的方式管理定制，此过程中同样无需从接收器/解码器输入任何数据。 This allows dynamic updating and management of customization, this process again without any data input from the receiver / decoder. 这一点在隐私法防止大多数形式的(即使不是所有形式的)未经请求的数据从接收器/解码器传送到其它各方的某些管辖区域中尤其重要。 This prevents most forms of privacy laws particularly important (if not all forms) unsolicited data transfer from the receiver / decoder to other parties in some jurisdictions in. 接收消息的装置可经调整以适于解码包含消息的MPEG专用表(MPEG privatetable)。  means for receiving a message may be adjusted to suit the MPEG private table (MPEG privatetable) comprises decoding the message. 这种MPEG专用表可能是后述的“操作通知表”(Action Notification Table)(ANT),或后述的“虚拟频道管理表”(Virtual Channel Management Table) (VCMT)0 这可以提高系统的效率，因为已证明MPEG专用表是传送消息的高效方式。 After this MPEG private table may be later "operation notification table" (Action Notification Table) (ANT), or said "virtual channel management table" (Virtual Channel Management Table) (VCMT) 0 which may improve the efficiency of the system since it has been demonstrated MPEG private table is an efficient way to deliver the message. 在本发明的一个相关方面，提供了一种接收器/解码器，包括:用于接收节目流的装置(例如，接收器)以及用于以本地存储的广告替换节目流的一些部分的装置(例如，处理器及相关存储器和/或切换装置(switch))。  In a related aspect of the present invention, there is provided a receiver / decoder, comprising: replacing portions of the program stream to a local storage device receives advertisement program stream (e.g., a receiver) and used for the apparatus (e.g., processor and associated memory and / or switching means (switch)). 在本发明的再一个方面，提供了一种用于管理节目的装置，包括:用于生成包含接收器/解码器节目输出所用的节目顺序规则的消息的装置(例如处理器及相关存储器)。  In a further aspect of the present invention, there is provided an apparatus for managing programs, comprising: means for generating a program sequence rules comprising a receiver / decoder outputs a program used for a message (e.g., processor and associated memory). 所述装置最好还包括用于将消息传送到接收器/解码器的装置(例如发送器)。 The  apparatus preferably further comprises means for transmitting a message to the receiver / decoder device (e.g., a transmitter). 此功能也可单独提供。 This function can also be provided separately. 所述装置最好还包括用于通过广播媒体广播消息的装置(例如广播系统连接)。 The apparatus preferably further comprises means for broadcasting the message via a broadcast medium (such as a broadcast system connection). 用于生成消息的装置最好适于在消息中包含寻址信息，以便消息只由具有给定特征的接收器/解码器来解码。 Means  for generating a message is preferably adapted to addressing information contained in the message, only the message to be decoded by receiver / decoders having given characteristics. 此外，用于生成消息的装置可经调整以适于生成对应于消息的MPEG专用表。 Further, means for generating a message may be adapted to be adjusted to generate a message corresponding to the MPEG private table. 在本发明的再一个方面，提供了一种用于管理节目流的方法，包括:接收节目流以及以本地存储的节目替换节目流的一些部分。  In a further aspect of the present invention, there is provided a method for managing a program stream, comprising: receiving a program stream, and locally stored program replacing portions of the program stream. 所述方法最好还包括:接收适合于一定范围的用户的多个节目以及从多个节目中选择适合于接收器/解码器的相关用户的至少一个节目。  Preferably, the method further comprising: receiving a plurality suitable for a range of users and selecting the programs adapted to the receiver / decoder of the at least one program related to the user from the plurality of programs. 在本发明的另一个相关方面，提供了一种管理节目的方法，包括:在接收器/解码器接收适合于一定范围的用户的多个节目以及从多个节目中选择适合于所述用户中的至少一个用户的至少一个节目。  In another related aspect of the present invention, there is provided a method of managing programs, comprising: a range suitable for receiving a plurality of user programs in a receiver / decoder, and selecting from a plurality of programs adapted to the at least one user of the at least one program in said user. 所述用户或每个用户最好与生成输出的接收器/解码器相关联。 The user or each user is preferably generated and output from the receiver / decoder is associated. 如上所述，所述多个节目可能是广告。 As described above, the plurality of programs may be advertisements. 所述方法还可以包括从存储器中删除所述存储的多个节目中未被选择以供输出的至少一个节目。  The method may further comprise deleting the stored plurality of programs from the memory the at least one program that is not selected for output. 最好在第一传输时隙期间接收多个节目，而在第二传输时隙期间输出所述节目。  preferably receives a plurality of programs during a first transmission slot, and output during a second transmission slot of the program. 所述第一传输时隙最好在预定时间出现，而所述第二传输时隙可以为广播频道期间的节目间断期。  The first transmission slot preferably occurs at a predetermined time and the second transmission slot may be a program break during a broadcast channel period. 所述第一和第二输出时隙还可以同时发生。 Said first and second output slot may also occur simultaneously. 选择节目的步骤还可以包括接收必须为所述第二传输时隙选择节目的消息的指示以及相应地选择节目。  The step of selecting a program may further comprise receiving an indication of a program must be selected for the second transmission slot and a corresponding message to select a program. 最好在广播节目流中接收消息，消息最好包括与所述第二传输时隙相关的定时信息。 Preferably receives a broadcast program stream message, the message preferably comprises timing information relating to the second transmission slot. 这提供如下优点:可以从例如广播中心利用至接收器/解码器的消息来遥控定制过程。 This provides the following advantages: the customization process can be controlled remotely from a broadcast center using a message, for example, to the receiver / decoder. 该消息最好包含期望的节目种类或类型。  The message preferably comprises a program genre or type desired. 所述方法还可以包括接收与多个节目中的各个节目相关联的控制数据，从而可以简化节目定制的管理。 The  method may further comprise receiving control data in each of a plurality of programs associated with the program, the program can be simplified custom administration. 最好根据所述接收到的控制数据来选择节目；所述控制数据最好包含简档数据；选择节目的步骤包括将此简档数据与接收器/解码器用户的相关用户简档作比较，并选择其相关简档数据严密匹配用户简档的节目。  Preferably according to the received control data to select a program; said control data preferably comprises profile data; comprising the step of selecting a program related to a user profile with this profile data receiver / decoder users compare and select its associated profile data closely matches the program user profile. 至少部分用户简档最好可由用户调整。  Preferably at least part of the user profile may be adjusted by the user. 可以根据期望的节目种类或类型来选择节目。 May be selected according to a desired program or program genre type. 或者，可以根据用户和/或接收器/解码器的特征来选择节目。 Alternatively, a program may be selected according to the characteristics of the user and / or receiver / decoder. 所述方法最好还包括:接收第二多个节目，从第二多个节目中选择第二节目，并输出第二节目。  The method preferably further comprises: receiving a second plurality of programs, selecting a second program from a second plurality of programs, and outputting the second program. 最好，所述方法还包括按传输时隙来调度所选择的第一或第二节目。 Preferably, the method further comprises a first program or a second transmission slot according to the selected schedule. 最好，所述方法还包括接收第二多个与节目相关的控制数据，而所述第二节目最好同样根据相关控制数据来选择。  Preferably, the method further includes receiving a second plurality of control data related to the program and the second program is preferably selected according to the same related control data. 可以在第一节目结束时或之后选择第二节目。 You may select the second program at or after the end of the first program. 选择第二节目的步骤最好包括:利用节目顺序规则计算第二多个节目相对于第一节目的兼容性等级，并选择兼容性等级高的节目。  Preferably the step of selecting the second object comprises: a second calculation using program sequence rules with respect to the first object of the plurality of program compatibility level, and select a high level of compatibility with the program. [0081 ] 此重要的特征也可单独提供。  This important feature may be provided separately. 相应地，在本发明的再一个方面，提供了一种管理节目的方法，包括:从第一多个节目选择第一节目，以及根据第一节目所用节目顺序规则从第二多个节目中选择第二节目。 Accordingly, in a further aspect of the present invention, there is provided a method of managing programs, comprising: selecting a first program from a first plurality of programs, and selecting from the second plurality of programs in accordance with program sequence rules used by the first program The second program. 所述方法最好还包括在接收器/解码器接收包含至少部分节目顺序规则的消息。 The  method preferably further comprises a message in the receiver / decoder comprises receiving at least a portion of the program sequence rules. 所述方法最好还包括以接收到的新节目顺序规则替换至少部分节目顺序规则。 The method preferably further comprises a regular sequence of received new program sequence rules replacing at least part of the program. 所述方法最好还包括(除在接收器/解码器接收之外)将包含节目顺序规则的消息发送到接收器/解码器。  The method preferably further comprises sending a message (except at the receiver / decoder receives) comprising program sequence rules to the receiver / decoder. 也可单独提供此重要特征以及其它特征。 This important feature may also be provided separately, and other features. 相应地，在本发明的再一个方面，提供了一种用于控制接收器/解码器的方法，包括:将包含接收器/解码器节目输出所用的节目顺序规则的消息发送到接收器/解码器。  Accordingly, in a further aspect of the present invention, there is provided a method for controlling a receiver / decoder, comprising: a receiver comprising program sequence rules / decoder used in the program output message sent to the receiver / decoder. 消息最好通过广播媒体广播。  The message is preferably broadcast via a broadcast medium. 如上所述，这可以提供一种非常简单的方式来管理大量接收器/解码器的内容定制。 As described above, this can provide a very simple way to manage a large number of the receiver / decoder content customization. 消息可以包含寻址信息，以便消息只由具有给定特征的接收器/解码器来解码。  message may comprise addressing information, so that the message is only decoded by receiver / decoders having given characteristics. 通过只将调度规则信息定址到可以接收广播消息的接收器/解码器的一个子集，这可以进一步简化和改善定制管理。 By scheduling rule information is addressed only to a subset of the received broadcast message may be a receiver / decoder, which can further simplify and improve the management of customization. 所述方法还可以包括:向接收器/解码器发送包含有关传输时隙的定时信息的消息和在传输时隙期间显示定制节目的指令。 The  method may further comprise: a decoder sends a message contains information about the slot timing information to the receiver / display instruction and customized program during the transmission time slot. 消息还可以包含与节目相关的种类或类型信息。 Message may also contain information related to the kind or type of program. 可单独提供此功能。 This feature may be provided separately. 所述方法还可以包括将与节目相关的控制数据发送到接收器/解码器，所述控制数据包含简档数据、定时信息以及最好还包括类别信息。  The method may further comprise transmitting control data related to the program to a receiver / decoder, the control data comprising profile data, timing information and preferably also category information comprises. 所述方法还可以包括:在第一传输时隙期间接收和存储多个节目，在第二传输时隙期间接收和输出预定节目，根据存储的简档选择所存储的节目之一，并输出选定的存储节目。  The method may further include: receiving and storing a plurality of programs during a first transmission slot, receiving and outputting a scheduled program during a second transmission slot, selecting one of the stored profile according to the stored program, and outputs the selected storage program. 此功能也可单独提供。 This function can also be provided separately. 所述方法还可以包括:选择具有与所存储的用户简档匹配的控制数据的第一节目，在第一传输时隙期间在第一频道上接收所选的第一节目，选择具有与所存储的用户简档匹配的控制数据的第二节目，切换到第二频道，以及在第二传输时隙期间在第二频道上接收所选择的第二节目；所述切换步骤在第一和第二传输时隙之间的同步节目间断期间执行。  The method may further comprise: selecting a first program having control data with the stored user profile matching, receiving the selected first program on a first channel during a first transmission slot, selecting a and a second program stored in the user profile match the control data is switched to the second channel, and receiving the selected second program on the second channel during a second transmission slot; said first switching step in during program execution and synchronization between the second transmission slots intermittently. 此功能也可单独提供。 This function can also be provided separately. 还提供了一种调度节目的方法，所述方法包括如下步骤:接收和存储两个或两个以上的节目；接收至少一个规则；以及根据结合了所接收的规则的调度算法来调度所存储的节目。  Also provided is a method of scheduling programs, the method comprising the steps of: receiving and storing two or more programs; receiving at least one rule; and scheduled according to a combination rule received scheduling algorithm the program stored. 所述方法还可以包括如下步骤:根据所存储的简档选择多个发送的节目的子集；以及只存储所发送节目的选定子集。  The method may further comprise the steps of: a subset of the plurality of selected stored profile transmitted programs; and storing only the selected subset of the transmitted programs. 本发明还提供了一种修改调度算法的方法；所述调度算法配置为:编辑确定向用户呈现节目的次序的时间表；所述调度算法存储在用户端系统上；所述方法包括将规则发送到用户端系统以结合到所述调度算法中的步骤。  The present invention further provides a method of modifying a scheduling algorithm; the scheduling algorithm is configured to: determine the schedule edit the presentation order of the program to a user; the scheduling algorithm stored on the client system; the method comprising the transmission rule to the client system incorporated into the scheduling algorithm step. 本发明还提供了一种集中控制用户端系统所执行的调度算法的方法。  The present invention further provides a method of controlling a centralized scheduling algorithm performed by the UE in the system. 因此，可以在任何时间传送新规则，用以更新调度算法。 Therefore, the new rules can be transferred at any time to update the scheduling algorithm. 本发明还提供了一种传送节目的方法，所述方法包括如下步骤:在第一传输时隙期间在第一频道上传送第一节目；在第二传输时隙期间在第二频道上传送第二节目；以及传送与所述第一和第二节目相关的控制数据；所述第一和第二时隙最好由同步节目间断期分开。  The present invention further provides a method of transmitting programs, the method comprising the steps of: transmitting a first program on a first channel during a first transmission slot; during a second transmission slot on the second channel conveying a second program; and transmitting control data related to said first and second program; the first and second slots preferably are separated by the synchronization of the program break. 与第二节目相关联的控制数据最好在同步节目间断期间传送。 The second control data associated with the program is preferably transmitted during the synchronized program break. 本发明提供了一种在节目间断期间或传输时隙之间的“交叉点”执行切换的方法。  The present invention provides a method of "intersection point" between the transmission time slot during a handover is performed or a program discontinuity. 通过使节目间断同步，可以向用户呈现一个无缝的节目序列。 By synchronizing the program break, the program may be presented with a seamless sequence to a user. 本发明还提供了一种控制虚拟频道的方法，所述方法包括如下步骤:接收和存储第一和第二节目；根据所存储的简档选择和检索所存储的第一节目；并删除或覆盖未选中的第二节目。  The present invention also provides a method of controlling a virtual channel, said method comprising the steps of: receiving and storing a first and a second program; a first program selection according to the profile and retrieve the stored stored; and delete or overwrite second program unchecked. 每个节目最好同时发送到两个或多个用户端系统。  Each program is preferably transmitted to two or more user end systems simultaneously. 最好，所述节目中的至少一个节目包含广告。 Preferably, said at least one program comprising program advertisement. 每个节目最好包含视频和/或音频分量。 Each program preferably includes video and / or audio component. 在本发明的再一个方面，提供了一种广播系统，包括:如上所述的接收器/解码器以及如上所述的装置。  In a further aspect of the present invention, there is provided a broadcast system, comprising: a receiver / decoder as described above and apparatus as described above. 在本发明的再一个方面，提供了一种用于向接收器/解码器传送的消息，它包含为给定传输时隙选择节目的指示和与所述传输时隙相关的定时信息。  In a further aspect of the present invention, there is provided a message for transmission to the receiver decoder /, which includes timing information to a given transmission slot indicating the selected program and associated with the transmission slot . 消息最好还包含期望的节目种类或类型。 Message preferably further comprises a desired program genre or type. 在本发明的再一个方面，提供了一种用于向接收器/解码器传送的消息，它包含节目顺序规则。  In a further aspect of the present invention, there is provided a message for transmission to the receiver decoder /, which comprises a program sequence rules. 此消息或上述消息最好还包含寻址信息。 This message, or the above message preferably further comprises addressing information. 还提供了一种控制数据，它包含简档数据、定时信息以及最好还有类别信息。  further provided a control data comprising profile data, timing information and preferably also category information. 在本发明的再一个方面，提供了一种MPEG专用表，它包含如上所述的消息。  In a further aspect of the present invention, there is provided an MPEG private table comprising a message as described above. 在本发明的再一个方面，提供了一种适于执行上述方法的计算机程序产品。  In a further aspect of the present invention, there is provided a computer program product adapted to perform the method described above. 在本发明的再一个方面，提供了一种适于修改接收器/解码器以使之可以执行上述方法的计算机程序产品。  In a further aspect of the present invention, there is provided a computer program product adapted to modify a receiver / decoder makes it possible to execute the above method. 在本发明的一个相关方面，提供了一种计算机程序产品，包括:用于从多个广告中选择适合于接收器/解码器的相关用户的广告的装置(在本例和后续实例中，其形式通常为一个或多个软件模块)。  In a related aspect of the present invention, there is provided a computer program product, comprising: means for selecting from the plurality of advertisement advertising adapted to the receiver / decoder related to the user (in the present example and subsequent examples , which is typically in the form of one or more software modules). 所述计算机程序产品最好还包括:用于在接收器/解码器接收和存储适合于一定范围的用户的多个节目的装置，用于从存储的多个节目中选择适合于接收器/解码器的相关用户的一个节目的装置，以及用于输出所述节目的装置。  Preferably the computer program product further comprising: a plurality of means for programming a receiver / decoder adapted to receive and store a range of the user for selecting from a plurality of stored programs adapted to receive It means a program related to user / decoder, and means for outputting the program. 多个节目最好是广告。  a plurality of programs is the best advertising. 所述计算机程序产品最好还包括用于从存储器中删除所存储的多个节目中未被选择以供输出的至少一个节目。 The computer program product preferably further comprises means for deleting the stored plurality of programs from the memory the at least one program that is not selected for output. 用于接收和存储多个节目的装置最好包括用于从广播比特流中提取多个节目的装置。  means for receiving and storing a plurality of programs preferably comprises means for extracting a plurality of programs from a broadcast bitstream. 最好在第一传输时隙期间接收多个节目，而最好在第二传输时隙期间输出所述节目。 Preferably receives a plurality of programs during a first transmission slot, and preferably output the program during a second transmission slot. 所述第一传输时隙最好在预定时间出现。 The first transmission slot preferably occurs at a predetermined time. 所述第二传输时隙最好为广播频道期间的节目间断期。 The second transmission slot is preferably a program break during a broadcast channel period. 所述第一和第二输出时隙最好是并发的。 Said first and second output slot is preferably concurrent. 选择节目的装置还可包括用于接收指示必须为所述第二传输时隙选择节目的消息的装置，以及用于相应地选择节目的装置。 Means  selecting a program may further comprise means for selecting a program to be a message is received indicating the second transmission slot, and means for the program selected accordingly. 该消息最好包含期望的节目种类或类型。 The message preferably comprises a desired program genre or type. 计算机程序产品最好还包括用于接收与多个节目中的各个节目相关联的控制数据的装置。 The computer program product preferably further comprises means for receiving control data in each of a plurality of programs associated with the program. 所述节目最好根据接收到的控制数据来选择。 The program is preferably selected according to the received control data. 控制数据最好包含简档数据；用于选择节目的装置最好包括:用于将这种简档数据与接收器/解码器用户的相关用户简档作比较的装置；以及用于选择其相关简档数据严密匹配用户简档的节目的装置。 Preferably the control data comprises profile data; means for selecting a program preferably comprises: means such profile data to the receiver / decoder related to the user's user profile to be compared; and means for selecting its associated the program means a user profile data closely matches the profile. 最好可由用户调整至少部分用户简档。 Preferably adjustable by the user at least part of the user profile. 最好根据期望的节目种类或类型来选择节目。  The best program to select a desired program genre or type. 还可以根据用户和/或接收器/解码器的特征来选择节目。 Program also may be selected according to a user and / or wherein the receiver / decoder. 所述计算机程序产品还可以包括用于接收第二多个节目的装置，用于从所述第二多个节目中选择第二节目的装置，以及用于输出第二节目的装置。 The computer program product may further comprise means for receiving a second plurality of programs, means for selecting a second program from the second plurality of programs, and for outputting a second destination device. 第二节目可以在第一节目结束时或之后选择。 The second program may be selected at or after the end of the first program. 用于选择第二节目的装置最好包括:利用节目顺序规则计算第二多个节目相对于第一节目的兼容性等级的装置；以及用于选择兼容性等级高的节目的装置。 Means for selecting a second program preferably comprises: using a plurality of the second program sequence rules program means calculates a first level of compatibility with respect to the object; and means a high level of compatibility of a program for selecting. 本发明还提供了一种计算机程序产品，包括:用于接收第一多个节目的装置，用于从所述第一多个节目中选择和输出第一节目的装置，用于接收第二多个节目的装置，以及用于从所述第二多个节目中选择和输出第二节目的装置；第二节目是根据第一节目所用节目顺序规则来选择的。  The present invention further provides a computer program product, comprising: means for receiving a first plurality of programs, means for selecting from said first plurality of programs and a first output destination device for receiving a second plurality of programs, and means for selecting from the second plurality of programs and a second output destination device; a second program is selected according to a first program sequence rules used by the program. 节目顺序规则可以限定指定时限内特定类型或种类的节目的重复次数。  program sequence rules may define the number of repetitions of a particular type or kind of a program specified time frame. 这些节目顺序规则还可以指定节目种类或类型的最佳组合和/或序列。 The program sequence rules may also specify the best combination of program genre or type and / or sequence. 所述计算机程序产品还可以包括用于在接收器/解码器接收包含至少部分节目顺序规则的消息。 The computer program product may further include a message in the receiver / decoder comprises receiving at least a portion of the program sequence rules. 所述计算机程序产品还可以包括用于以接收到的新节目顺序规则替换至少部分节目顺序规则的装置。 The computer program product may further comprise a regular sequence of received new program replacing apparatus at least partially in the program sequence rules. 还提供了一种计算机程序产品，包括:用于向接收器/解码器传送包含节目顺序规则的消息的装置。  further provided a computer program product, comprising: means for a message comprising program sequence rules to the receiver / decoder transfer. 消息最好通过广播媒体广播。 Message is preferably broadcast via a broadcast medium. 消息可以包含寻址信息，以便消息只由具有给定特征的接收器/解码器来解码。 Message may comprise addressing information, so that the message is only decoded by receiver / decoders having given characteristics. 在本发明的再一个方面，提供了一种实际体现上述计算机程序产品的信号。  In a further aspect of the invention, there is provided a practical signal the computer program product embodied. 例如，这种信号可以是一组内部分组或者在数字电视系统中广播的消息集合。 Such signal may be a set of internal packets or broadcast digital television system, set of messages. 在本发明的再一个方面，提供了一种实际包含上述计算机程序产品的计算机可读媒体。  In a further aspect of the invention there is provided a computer-readable medium comprising the computer program a practical product. 此类计算机可读媒体可以是例如CD-ROM。 Such computer readable media may be, for example, CD-ROM. 本发明还提供了一种用于实现任一所述方法和/或体现任一所述装置特征的计算机程序和计算机程序产品，以及一种其中存储了实现任一所述方法和/或体现任一所述装置特征的程序的计算机程序产品。  The present invention further provides a method and / or reflect any of the apparatus features a computer program and a computer program product, and an implement any stored therein for implementing any of the methods and / program or a computer program product embodied in any of the apparatus features. 本发明还提供了基本如参照附图所述那样的方法和/或装置。  The present invention also provides a method substantially as above with reference to the accompanying drawings and / or devices. 本发明一个方面中的任何特征可以任意组合形式应用于本发明的其它方面。 Any feature in one aspect of the invention  may be present in any combination be applied to other aspects of the invention. 具体来说，方法方面可以适用于装置方面，反之亦然。 In particular, method aspects may be applied to apparatus aspects and vice versa. 现在参考附图，通过实例来说明本发明的优选特征。  Referring now to the drawings, preferred features of the invention will be described by way of example. 图16是详细说明评估广告的适合性的方法的流程图。  FIG. 16 is a flowchart of a method for evaluation of advertising in detail. 图1中显示了数字电视系统500的总体示意图。  FIG. 1 shows a schematic overview of a digital television system 500. 正如下面所讨论的那样，系统500包括广播中心1000、接收器/解码器2000、接收器/解码器的软件/硬件体系结构3000、交互式系统4000以及条件访问系统5000，这些均将在下面加以说明。 As discussed below, the system 500 comprises a broadcast center 1000, a receiver / decoder 2000, the receiver / decoder software / hardware architecture 3000, the interactive system 4000 and conditional access system 5000, which are in the following will be instructions. 系统500通常包括常规数字电视系统502，它采用众所周知的MPEG-2压缩系统来传送压缩的数字信号。  The system 500 generally comprises a conventional digital television system 502, which uses digital signal known MPEG-2 compression system to transmit compressed. 更具体地来说，广播中心1000中的MPEG-2压缩器1010接收数字信号流(通常为视频信号流)。 More specifically, the broadcast center 1000 MPEG-2 compressor 1010 receives a digital signal stream (typically a stream of video signals). 压缩器1010通过连接1020连接到复用器和扰码器1030。 The compressor 1010 is connected to the multiplexer 1020 and the connector 1030 through the scrambler. 复用器1030接收到其它的多个输入信号，组装传输流，并通过连接1022 (当然可以采用各种各样的包括电信链路的形式)将压缩的数字信号传送到广播中心的发送器510。  The multiplexer 1030 receives a plurality of further input signals, assembling a transport stream, and 1022 through the connection (of course may take a variety of forms including telecommunications links) transfer compressed digital signal to the broadcast center transmitter 510. 发送器510通过上行链路514向卫星转发器520发送电磁信号，在卫星转发器中对这些电磁信号进行电子处理并通过概念上的下行链路516传送到地面接收器512，它类似通常最终用户所拥有或所租用的碟形卫星天线。 510 520 sends the transmission through an uplink 514 towards a satellite transponder electromagnetic signals, electronic processing of these electromagnetic signals in the satellite transponder and transmitted to the surface by the downlink receiver 512 on the conceptual 516, which is similar to the end user generally owned satellite dish or leased. 当然采用其它传输信道来传输数据也是可行的，例如地面广播、电缆传输、卫星/电缆的组合链路、电话网等。 Of course, using other transport channels to transmit data are possible, such as terrestrial broadcast, cable transmission, combined satellite / cable links combination, telephone network. 接收器512接收到的信号被传送到最终用户拥有或租用的集成接收器/解码器2000，并连接到最终用户的电视机10000。  The receiver 512 receives the signal transmitted to the end-user owned or rented by the integrated receiver / decoder 2000, and is connected to the end user's television 10000. 接收器/解码器2000将压缩的MPEG-2信号解码成电视机10000的电视信号。 MPEG-2 signal receiver / decoder 2000 decodes the compressed television signal TV 10000. 虽然图1中显示的是分设的接收器/解码器，但是接收器/解码器还可以是集成数字电视的一部分。 Although shown in Figure 1 is divided into a receiver / decoder, the receiver / decoder may also be part of an integrated digital television. 此处所用的术语“接收器/解码器”包括分离的接收器/解码器，如机顶盒以及集成了接收器/解码器的电视机。 As used herein, the term "receiver / decoder" includes a separate receiver / decoder, set-top box and an integrated receiver / decoder of the television set. 在接收器/解码器2000中，提供了硬盘2100，其中存储了音视频和其它数据。  In the receiver / decoder 2000, a hard disk 2100, which stores audio, video and other data. 这允许对接收器/解码器所接收到的节目应用高级的录制和回放功能，还允许将大量其它类型的数据(如电子节目指南数据)存储在接收器/解码器中。 This allows the receiver / decoder received program application advanced recording and playback, also allows a large number of other types of data (such as electronic program guide data) stored in the receiver / decoder. 接收器/解码器中的内容管理和保护系统(CMPS) 2300 (未显示)提供安全灵活地控制硬盘2100 (或其它存储设备)上所进行的数据录制和回放的能力。  The receiver / decoder content management and protection system (CMPS) 2300 (not shown) provides the ability to secure data recording and playback flexibly controls the hard disk 2100 (or other storage device) performed. 在多信道系统中，复用器1030处理从多个并行信息源接收的音频和视频信息，并与发送器510进行交互以便沿相应数量的信道广播信息。  In a multichannel system, the multiplexer 1030 from a plurality of parallel processing audio and video information received by the information source, and interacts with the transmitter 510 so that the information along a corresponding number of broadcast channels. 除视听信息外，消息或应用程序或任何其它种类的数字数据还可与所传送的数字音频和视频信息交织而引入到一些或全部信道中。 In addition to audiovisual information, messages or applications or any other sort of digital data may be digital audio and video information transmitted interleaving introduced into some or all channels. 交互系统4000连接到复用器1030和接收器/解码器2000，它部分位于广播中心，部分位于接收器/解码器中。  An interactive system 4000 is connected to the multiplexer 1030 and the receiver / decoder 2000, which partly in the broadcast center and partly in the receiver / decoder. 这样可使最终用户能够通过反向信道570与各种应用程序交互。 This allows the end user to the channel 570 through the application interacts with the various reverse. 所述反向信道可以是，例如公众交换电话网(PSTN)信道(例如，调制解调的反向信道(modemmed back channel))或带外(OOB)信道。 The back channel may be, for example, the public switched telephone network (PSTN) channel (e.g., modem back channel (modemmed back channel)) or the band (the OOB) channel. 条件访问系统5000，同样也连接到复用器1030和接收器/解码器2000，也部分位于广播中心而部分位于接收器/解码器中，它可使最终用户能够访问来自一个或多个广播提供商的数字电视广播。  The conditional access system 5000, also connected to the multiplexer 1030 and the receiver / decoder 2000, partly in the broadcast center and partly located in the receiver / decoder, enables the end user to access it from one or more digital TV broadcasting broadcast provider. 可对有关付费节目(即广播提供商销售的一个或多个电视节目)的消息进行解密的智能卡可以插入接收器/解码器2000中。 News about the program can pay (ie, one or several television programs sold by the broadcast supplier) decrypting smart card can be inserted into the receiver / decoder 2000. 利用接收器/解码器2000和智能卡，最终用户可以以预订方式或按观看次数付费的形式购买这些付费节目。 Using the receiver / decoder 2000 and smartcard, the end user can buy these programs pay a reservation or pay-per-view form. 通常这是利用交互系统4000所采用的反向信道570来实现的。 This is usually achieved by interaction system reverse channel 5,704,000 employed. 如上所述，系统传送的节目在复用器1030进行扰码，由访问控制系统5000确定施加于给定传输的条件和加密密钥。  As described above, programs transmitted by the system are scrambled at the multiplexer 1030, the access control system 5000 is determined by the conditions and encryption keys applied to a given transmission. 在付费TV系统领域，这种方式的加扰数据传送是众所周知的。 In the field of pay TV systems, scrambling the data transfer in this way it is well known. 通常，扰码数据与用于对数据解扰的控制字一起传输，控制字本身由所谓的使用密钥(exploitation key)加密并以加密方式传送。 Typically, scrambled data is transmitted together with a control word for descrambling of the data, the control word itself being encrypted by a so-called exploitation key (exploitation key) and transmitted in encrypted form. 然后扰码的数据和加密的控制字由接收器/解码器2000接收，接收器/解码器2000可利用插入在接收器/解码器中的智能卡所存储的使用密钥的等效密钥对加密的控制字进行解密，然后对传输的数据进行解扰。  The data is then scrambled and encrypted control word received by the receiver / decoder 2000, the receiver / decoder 2000 may utilize using a key inserted into the receiver / decoder smart card equivalent to the stored secret key to decrypt the encrypted control word and descramble the transmitted data. 已付费的预订用户将在例如每月广播的EMM(授权管理消息)中接收使用密钥，此密钥是对加密的控制字解密以允许观看传输节目所必需的。 A paid-up subscriber will, for example, in a broadcast monthly EMM received using a key (entitlement management message), then this is a key to decrypt the encrypted control word so as to permit viewing of the transmission program necessary. 图2显示数字电视系统504的备选实施例，它利用电缆网络作为压缩数字信号的广播媒体。  Figure 2 shows an alternative embodiment of a digital television system 504, utilizing a cable network as the broadcast medium compressed digital signals. 在此附图中，同样的部件以同样的数字表示。 In this figure, the same parts are indicated by like numerals. 卫星转发器和传送和接收站被由电缆网络550代替。  satellite transponder and transmitting and receiving stations are replaced by a cable network 550. 此外，在此特定实施例中，接收器/解码器2000与交互系统4000和条件访问系统5000之间的调制解调的反向信道被取消，代之以电缆网络550与条件访问系统5000和交互系统4000之间的各相应连接554、556。 Further, in this particular embodiment, the receiver / decoder 2000 and the modem back channel 5000 between the interactive system 4000 and conditional access system is canceled and replaced by a cable network 550 and the conditional access system 5000 and interactive each respective connection 554, 556 between the 4000 system. 接收器/解码器2000因此通过电缆网络550与其它系统通信，具体是利用电缆调制解调器或其它装置来使之可以通过与从广播中心接收数据所用链路相同的链路来发送和接收数据。 The receiver / decoder 2000 thus communicates with the cable network 550 to other systems, in particular with a cable modem or other means so that it can send and receive data by the data from the broadcast center links with the same link and reception. 电缆网络550还可以是任何形式的广域网(WAN)，如专用连接、因特网、本地有线分配网络、无线网络或以上方式的任意组合。  cable network 550 may be any form of wide area network (WAN), such as any combination of dedicated connection, the internet, local cable distribution network, wireless network, or the above manner. 在本实施例中，采用了混合型光纤同轴电缆(HFC)网络。 In the present embodiment, using a hybrid fiber coaxial (HFC) network. 应理解，接收器/解码器2000与电视系统的其它部件之间的各种通信方式是可互换的。 It should be understood, the receiver / decoder 2000 and various other components of the communication between the television system are interchangeable. 参考图3，在总体示意图中条件访问系统5000包括预订用户授权系统(SAS)5200。  Referring to FIG. 3, the overall schematic conditional access system 5000 includes a Subscriber Authorization System reservation (SAS) 5200. SAS 5200通过链路1044 (可以是TCP-1P链路或其它类型的链路)连接到一个或多个预订用户管理系统(SMS) 1100，一个SMS对应于一个广播提供商。 SAS 5200 via link 1044 (can be a TCP-1P link, or other type of link) to one or more subscribing user management system (SMS) 1100, one SMS corresponding to a broadcast provider. 或者，一个SMS可以为两个商业运营商之间共享，或者一个运营商可以采用两个SMS,如此等等。 Alternatively, an SMS can be shared between two commercial operators, or one operator could use two SMS, and so on. 形式为利用“母”智能卡5110的加密单元5100的第一加密单元通过连接1042连接到SAS。  using the form "mother" smartcard encrypts unit 5110 of the first encryption unit 5100 by connection to the SAS 1042. 然后，形式为利用“母”智能卡5112的加密单元5102的第二加密单元通过连接1040连接到复用器1030。 Then, using the form of a "mother" smartcard 5112 of the second encryption unit encrypting unit 5102 via the connector 1040 connected to the multiplexer 1030. 接收器/解码器2000接纳“子”智能卡5500。 Receiver / decoder 2000 receiving the "daughter" smartcard 5500. 接收器/解码器通过通信服务器1200和调制解调的反向信道570直接与SAS 5200连接。 The receiver / decoder via the communications server 1200 and the modem back channel 570 is connected directly to the SAS 5200. SAS根据请求向子智能卡发送预订权利等信息。 SAS transmits reservation information to the rights daughter smartcard on request. 在优选实施例的变体中，以因特网或电缆连接来补充或替代PSTN 570和通信服务器1200。  In a variation of the preferred embodiment, the cable connection to the Internet or to supplement or replace the PSTN 570 and communications servers 1200. 智能卡包含一个或多个商业运营商的机密信息。  Smart cards contain one or more commercial operators of confidential information. “母”智能卡对不同种类的消息进行加密，而“子”智能卡对这些消息进行解密(如果它们有权这样做)。 "Mother" smartcard encrypts different kinds of messages and the "daughter" smartcards decrypt these messages (if they are entitled to do so). 参考图3，在广播中心，首先利用MPEG-2压缩器1010压缩数字视频信号(或降低比特率)。  Referring to FIG 3, in the broadcast center, firstly MPEG-2 compressor 1010 compresses the digital video signal (or bit rate reduced). 然后将经过压缩的信号传送到复用器和扰码器1030，以便与其它数据复用，例如其它的压缩数据。 Then transmits the compressed signal to the multiplexer and scrambler 1030 in order to be multiplexed with other data, such as other compressed data. 扰码器生成扰码处理所用并包含在复用器1030的MPEG-2流中的控制字。  The scrambler generates a scrambled control words used and contained in the MPEG-2 stream in the multiplexer 1030. 控制字是在内部生成的，它使最终用户的集成接收器/解码器2000能够对节目进行解扰。 A control word is generated internally, which enables the end user's integrated receiver / decoder 2000 to descramble the program is possible. 还将访问标准(指示如何使节目商品化)添加到MPEG-2流中。  Access criteria also (indicating how the program is commercialized) was added to the MPEG-2 stream. 可以采用多种“预订”模式之一和/或多种“每次观看付费”(PPV)模式之一或赛事来使节目商品化。 One can use a variety of "booking" mode and / or a variety of "Pay Per View" one (PPV) mode or race to commercialize the program. 在预订模式中，最终用户预订一个或多个付费节目，或者预定“节目组(bouquets)”而获得观看这些节目组内的每个频道的权利。 In the subscription mode, the end user subscribes to one or more of the pay program, or a predetermined "program group (Bouquets)" and the right to watch every channel inside those program group. 在每次观看付费的模式中，赋予最终用户按照需要购买赛事观看权的能力。 In the Pay Per View mode, gives end users the ability to purchase in accordance with the right to watch the tournament. 控制字和访问标准均用于构建授权控制消息；这是一种结合加扰节目发送的消息；该消息包含控制字(它允许对节目解扰)和广播节目的访问标准。  the control word and the access criteria are used to build an Entitlement Control Message; this is a combination of message transmitted scrambled program; the message contains a control word (which allows for the descrambling of the program) and the access criteria of the broadcast program. 访问标准和控制字通过连接1040传送到第二加密装置5102。 Access criteria and control word 1040 by connecting to the second encryption device 5102. 在此单元中生成并加密ECM，然后将其传送到复用器和扰码器1030。 Generated and encrypted ECM In this unit, and then transmitted to the multiplexer and scrambler 1030. 广播提供商在数据流中广播的每个服务包括若干不同的分量；例如电视节目包括视频分量、音频分量、字幕分量等。  Each service broadcast by a broadcast supplier in a data stream comprises a number of distinct components; for example a television program includes a video component, an audio component, a subtitle component and the like. 对一个服务的这些分量中的每个分量分别进行加扰和加密，然后再广播。 Each of these components of a service in the scrambling and encryption are performed, and then broadcast. 每个加扰的服务分量需要一个单独的ECM。 Each scrambled component of the service requires a separate ECM. 复用器1030接收的电子信号包含来自SAS 5200的加密的EMM、来自第二加密装置5102的加密的ECM以及来自压缩器1010的压缩节目。  The multiplexer 1030 receives electrical signals comprising encrypted EMM from the SAS 5200, encrypted second encryption device from an ECM 5102 and compressed programs from the compressor 1010. 复用器1030对节目进行扰码，并将扰码后的节目、加密的EMM和加密的ECM作为电子信号发送到广播系统600，广播系统600可以是例如图1所示的卫星系统或其它广播系统。 The multiplexer 1030 pairs program is scrambled, and the scrambled programs, the encrypted EMM encrypted ECM and transmitted to the satellite 600 may be, for example, the system shown in FIG. 1, or other broadcast of the broadcast system 600, a broadcast system as electronic signals system. 接收器/解码器2000对信号解复用，以获得含加密的EMM和加密的ECM的加扰节目。 Solutions signal 2000 pairs of the receiver / decoder multiplexed to obtain the encrypted EMM containing the encrypted ECM and the scrambled program. 接收器/解码器接收到该广播信号，并提取MPEG-2数据流。  The receiver / decoder receives the broadcast signal and extracts the MPEG-2 data stream. 如果节目进行了扰码，则接收器/解码器2000从MPEG-2数据流提取对应的ECM，并将该ECM传送给最终用户的“子”智能卡5500。 If the program has been scrambled, the receiver / decoder 2000 extracts the corresponding ECM from the MPEG-2 data stream, the ECM and transmitted to the end user "daughter" smartcard 5500. 该卡插入到接收器/解码器2000中。 The card is inserted into the receiver / decoder 2000. 该子智能卡5500控制最终用户是否有权解密ECM和访问该节目。 The daughter smartcard 5500 controls whether the end user has the right to decrypt the ECM and to access the program. 如果没有，则将否定状态传送到接收器/解码器2000，以指示不能对节目解扰。 If not, a negative status will be transmitted to the receiver / decoder 2000 to indicate that the program can not be descrambled. 如果最终用户有权，则对该ECM解密，并提取控制字。 If the end user has the right, the ECM is decrypted and the control word extracted. 然后解码器2000就可以利用此控制字对节目解扰。 The decoder 2000 can then use this control word for descrambling of the program. 将MPEG-2数据流解压，并转换成视频信号，以便向前传送到电视机10000。 The MPEG-2 data stream is decompressed, and converted into a video signal for onward transmission to television set 10000. 如果节目未加扰，则不会有ECM与MPEG-2数据流一起传送，接收器/解码器2000对数据解压缩，并将该信号转换成视频信号，以便传送到电视机10000。  If the program is not scrambled, no ECM will be transmitted with the MPEG-2 stream with the receiver / decoder 2000 decompresses the data and converts the signal into a video signal for transmission to television set 10000. 预订用户管理系统(SMS) 1100包括数据库1150，它管理所有最终用户文件、商业报价(如价目表和优惠)、预订、PPV详细信息以及有关最终用户消费和授权的数据等。  reservation Subscriber Management System (SMS) 1100 includes a database 1150 which manages all of the end user files, commercial offers (such as price lists and promotions), subscriptions, PPV details, and data regarding end user consumption and authorization and so on. SMS可以在物理上远离SAS。 SMS may be physically remote from the SAS. SMS 1100向SAS 5200传送暗示修改或创建将要传送给最终用户的的授权管理消息(EMM)的消息。  SMS 1100 modified or created to be transferred to the end user authorization management messages (EMM) messages imply the transfer to SAS 5200. SMS 1100还向SAS 5200传送未暗示修改或创建EMM而只暗示最终用户状态变化(一般涉及订购产品时授予最终用户的权限或最终用户将要支付的金额)的消息。 SMS 1100 also transmits SAS 5200 does not suggest to modify or create EMM only imply the end user status changes (usually involving an amount granted to the end user when ordering products or end-user rights to be paid) messages. SAS 5200还向SMS1100发送消息(通常是请求诸如回叫信息或计费信息之类的信息)，以便两者之间的通信看上去是双向的。 SAS 5200 also sends messages to the SMS1100 (typically requesting information such as call-back information or billing information and the like), so that the communication between the two appears to be bi-directional. 现在参考图4，以功能块的形式描述接收器/解码器2000的各个部件。  Referring now to Figure 4, in the form of functional blocks described the various components of the receiver / decoder 2000. 接收器/解码器2000可以是例如数字机顶盒(DSTB)，它包括中央主处理器2002和数字TV协处理器2004，它们都具有相关的存储器部件(未显示)并通过协处理器总线2006连接在一起。  The receiver / decoder 2000 may be a digital set-top box (DSTBs), which comprises a central host processor 2002 and a digital TV coprocessor 2004, both having associated memory means (not shown) through a coprocessor bus and 2006 connected together. 协处理器2004适于从USB接口2070、串行接口2072、并行接口(未显示)、调制解调器2074 (连接到图1的调制解调反向信道570)以及解码器的前面板2054上的开关触点(switch contact)接收输入数据。 Coprocessor 2004 is adapted from the USB interface 2070, the serial interface 2072, a parallel interface (not shown), a modem 2074 (connected to the modem back channel 570 of FIG. 1), and switch contacts 2054 on the front panel of the decoder point (switch contact) receives input data. 该接收器/解码器还适于接收来自红外线遥控器2080 (以及可选的诸如具有篮牙功能的装置之类的其它无线外设2082)的输入，并且还具有两个智能卡读卡器2050和2052，这两个读卡器适于分别读取银行智能卡2060和预订智能卡2062。  The receiver / decoder is further adapted to receive an input from the infrared remote controller 2080 (as well as other wireless peripheral devices such optional function such as a Bluetooth 2082), and also having two smartcard readers 2050 and 2052, the two card readers adapted to read bank smart cards and subscription smartcard 2060 2062. 预订智能卡2052配合插入的预订智能卡2062以及条件接收单元(未显示)工作以向解复用器/解扰器/再复用器单元2010提供必要的控制字，以便可以对加密的广播信号进行解扰。 The subscription smartcard 2052 with an inserted subscription smartcard 2062 and condition reception unit (not shown) operates to / descrambler / remultiplexer unit 2010 to provide the necessary control word to a demultiplexer so as to be de-encrypted broadcast signals interference. 解码器还包括常规的调谐器2016和解调器2012，以便在解调器/解扰器单元2010对卫星传输信号进行滤波和解复用之前接收和解调该信号。 The decoder also includes a conventional tuner 2016 and demodulator 2012 to the demodulator / descrambler unit 2010 transmit the satellite signal is filtered before demodulation and reconciliation receiving the multiplexed signal. 还设有第二调谐器2018和第二解调器2014，以允许并行接收和解码第一信道第和二信道。 There is also a second tuner 2018 and second demodulator 2014, to allow parallel receive and decode a first channel and a second channel two. 还设有硬盘2100，用于存储接收器/解码器接收和生成的节目和应用程序数据。  2100 is also provided with a hard disk, for storing program and application data receiver / decoder receives and generates. 连同两个调谐器2016和2018、两个调制器2012和2014、解扰器/解复用器/再复用器2010以及数据解码器2024以及音频解码器2026 —起，还提供了高级录制和回放功能，以允许在观看某个节目时同时录制其它的一个或多个节目，更一般地来说，允许节目在硬盘和显示装置之间和/或输入和输出之间传送，所有操作都是并行进行的。 Together with the two tuners 2016 and 2018, two modulators 2012 and 2014, the descrambler / demultiplexer / remultiplexer 2010, and a data decoder 2024 and audio decoder 2026-- from, and also provide a high recording playback function to allow other recording one or more programs simultaneously while viewing a certain program, and more generally, to allow a program or transferred between the hard disk and the display device and / or input and output operations are all in parallel. 接收器/解码器中的音频输出2038和视频输出2040分别由PCM混合器2030和音频DAC 2034，与MPEG视频解码器2028、图形引擎2032和PAL/SECAM编码器2036来馈送信号。  The receiver / decoder 2038 and video output audio output by the PCM mixer 2040 are respectively 2030 and audio DAC 2034, and the MPEG video decoder 2028, graphic engine 2032 and PAL / SECAM encoder 2036 used to feed signal. 当然也可以设置备选的或互补的输出。 Of course, also be provided an alternative or complementary output. 在本说明书中，术语应用最好是用于控制尤其接收器/解码器2000的高级功能的计算机代码段。  In the present specification, the term application is preferably computer code segments for controlling a particular function of advanced receiver / decoder 2000 is. 例如，当最终用户将遥控器2080对准电视机(未显示)屏幕上可见的按钮对象并按下确认键时，就运行与此按钮相关联的指令序列。 For example, when the end user of the television set remote controller 2080 (not shown) a button object seen on the screen and pressing the Enter key, the instruction sequence associated with the button. 应用程序和相关中间件由主处理器2002来执行，且在需要时通过协处理器总线2006对数字TV协处理器2004执行远程过程调用(RPC)。 Applications and related middleware executed by the main processor to 2002, and the coprocessor bus 20,062,004 perform a remote procedure call (RPC) for digital TV coprocessor when needed. 交互式应用程序应最终用户请求提供菜单和执行指令，并提供与该应用程序的用途有关的数据。  The interactive application should provide the end user requests a menu and executes instructions, and provides data relating to the use of the application. 应用程序可以是常驻应用程序，即存储在接收器/解码器2000的ROM (或闪速存储器或非易失存储器)或者广播和下载到接收器/解码器2000的RAM、闪速存储器或硬盘中。 Applications may be either resident applications, that is stored in the receiver / decoder 2000 a ROM (or flash memory or nonvolatile memory), or broadcast and downloaded into the receiver / decoder 2000 of RAM, a flash memory or a hard disk in. 应用程序被存储在接收器/解码器2000的存储位置并以表示为资源文件。  application program stored in the storage position of the receiver / decoder 2000 and represented as resource files to. 这些资源文件包括图形对象描述单元文件、变量块单元文件、指令序列文件、应用程序文件和数据文件。 The resource files comprise graphic object description unit files, variables block unit files, instruction sequence files, application files and data files. 接收器/解码器包括划分为至少一个RAM卷、闪速存储器卷和至少一个ROM卷的存储器(未显示)，但此物理组织结构不同于逻辑组织结构。  The receiver / decoder comprises a RAM into at least one volume and at least one flash memory volume of the ROM volume memory (not shown), but this physical organization is distinct from the logical organization structure. 存储器还可以被划分为与各种接口相关联的存储器卷。 The memory also may be divided into various memory volumes associated with the interface. 从一个观点来看，存储器可以视为硬件的一部分；而从另一观点来看，存储器可以视为支持或包含与硬件分开的整个所示系统。 From one point of view, the memory can be regarded as part of the hardware; from another point of view, the memory system can be regarded as supporting or containing the whole shown apart from the hardware. 参考图5，接收器/解码器的软件/硬件体系结构3000包括五个软件层，如此组织是为了能够在任何接收器/解码器中，使用任何操作系统来实现所述软件。  Referring to FIG 5, the receiver / decoder software / hardware architecture 3000 comprises five software layers, organized so to be able to at any receiver / decoder, be implemented using any operating system, said software. 各软件层包括应用程序层3100、应用程序编程接口(API)层3300、虚拟机层3500、设备接口层3700 (—般简称为“设备层”)以及软件/硬件系统层3900。 Various software layers including application layer 3100, an application programming interface (API) layer 3300, virtual machine layer 3500, device interface layer 3700 (- generally referred to as "device layer"), and software / hardware layer 3900. 应用程序层3100包括驻留于和下载到接收器/解码器中的应用程序3120。  The application layer 3100 includes residing in 3120 and applications downloaded into the receiver / decoder. 这些程序可以是客户使用的使用例如Java、HTML、MEG-5或其它语言编写的交互式应用程序，或者它们可以是接收器/解码器用于其它目的(例如为运行此类交互式应用程序)的应用程序。 These programs may be used by the customer for example Java, HTML, MEG-5 or other languages ​​written in interactive applications, or they may be a receiver / decoder for other purposes (e.g., such as running an interactive application) application. 此层基于虚拟机层所提供的一组开放式应用程序编程接口(API)来实现。 This layer is based on a set of open application programming interface (API) provided by the virtual machine layer is achieved. 本系统允许应用程序即时或按需下载到接收器/解码器中的硬盘、闪速存储器或RAM存储器。 This system allows for real time or on demand applications downloaded into the receiver / decoder, a hard disk, a flash memory or RAM memory. 应用程序代码可以利用诸如数据存储媒体命令和控制(DSMCC)、网络文件服务(NFS)协议或其它协议以压缩或非压缩的格式传送。 Application code may be utilized, such as data storage Media Command and Control (DSMCC), Network File Service (NFS) protocol or other protocols to transmit compressed or uncompressed format. API层3300提供用于交互式应用程序开发的高级实用工具。  API layer 3300 provides high-level utilities for interactive application development. 它包括多个构成此高级API的程序包。 It includes multiple packages constituting the high-level API. 这些程序包提供运行交互式应用程序所需的所有功能。 These packages provide all the functionality needed to run interactive applications. 这些程序包可以被应用程序访问。 These packages can be accessed by applications. 在优选实施例中，该API适合于用Java、PanTalk或类似的编程语言编写的应用程序。  In a preferred embodiment, the API is adapted for applications written in Java, PanTalk or similar programming languages. 此外，它还可协助解释HTML和其它格式(如MHEG-5)。 In addition, it may assist in the interpretation of HTML and other formats (such as MHEG-5). 除这些特征之外，它还包括按需可卸装和可扩展的其它程序包和服务模块。 In addition to these features, and further comprising on demand uninstall scalable other packages and service modules. 虚拟机层3500由语言解释器和各种模块及系统构成。  virtual machine layer 3500 is composed of language interpreters and various modules and systems. 此层由内核3650(未显示)来管理，它由接收和执行接收器/解码器中的交互式应用所必需的所有部件组成。 This is managed by the kernel layer 3650 (not shown), which consists of all members to receive and execute the receiver / decoder interactive application necessary components. 设备接口层3700包括设备管理器和软件设备(本说明书通常仅称为“设备”)。  the device interface layer 3700 includes a Device Manager and software devices (generally referred to simply as the present specification, "device"). 设备是由管理内部事件和物理接口所必需的逻辑资源组成的软件模块。 Devices are managed by the software module internal events and physical interfaces and logical resources necessary for the composition. 设备接口层在设备管理器的控制下，管理驱动程序和应用程序之间的通信，并提供增强的错误异常检查。 The device interface layer, under the control of the device manager, communication between the management applications and drivers, and provides enhanced error exception checking. 被管理的(硬件)设备的实例有:读卡器3722 (未显示)、调制解调器3730 (未显示)、网络3732 (未显示)、PCMCIA (个人计算机存储卡国际协会)、LED显示屏等。 Examples of (hardware) managed devices are: card readers 3722 (not shown), modems 3730 (not shown), network 3732 (not shown), the PCMCIA (Personal Computer Memory Card International Association), LED display and so on. 程序员不必直接处理此层，因为API层从上控制这些设备。 Programmers do not have to process this layer directly, since the API layer controls the devices from. 系统软件/硬件层3900由接收器/解码器的制造商提供。  The system software / hardware layer 3900 is provided by the receiver / decoder manufacturer. 因为系统的模块化以及更高级的操作系统提供的服务(如事件调度和存储器管理)属于虚拟机和内核的一部分，所以高层并不受限于特定的实时操作系统(RTOS)或特定的处理器。 Because the modular system of services and more advanced operating system provides (such as event scheduling and memory management) are part of the virtual machine and the kernel, so executives are not limited to a particular real-time operating system (RTOS) or specific processor . 通常虚拟机层3500有时与设备接口层3700和/或API层3300相结合，被称为接收器/解码器的“中间件”。  Generally virtual machine layer 3500 may be combined with the device interface layer 3700 and / or API layer 3300, it referred to the receiver / decoder "middleware." 现在参考图6详细说明接收器/解码器的对应于图5上半部分的软件体系结构3000 (包括应用程序层3100、API层3300和虚拟机层3500)。  Referring now to FIG. 6 details a corresponding receiver / decoder in the software architecture of FIG. 5 half section 3000 (including the application layer 3100, API layer 3300 and virtual machine layer 3500). 交互式应用程序是用户与之交互以便例如获取产品和服务的应用程序，如电子节目指南、计算机银行应用(telebanking application)以及游戏。  The interactive application is a user interacts for example, to obtain the application of products and services such as electronic program guides, computer banking application (telebanking application) as well as games. .引导程序。  Boot Loader. 引导应用程序3142是接收器/解码器开机时首先启动的应用程序。 Boot application 3142 is the receiver / decoder is first turned on to start the application. 引导应用程序首先启动应用程序管理器3110，然后启动虚拟机3500中的“管理器”软件模块，如存储器管理器3544和事件管理器3546。 Boot application first starts the Application Manager 3110, and then start the virtual machine 3500 in the "Manager" software modules, such as memory manager and event manager 3544 3546. . 应用程序管理器。  The application manager. 应用程序管理器3110管理运行于接收器/解码器中的交互式应用程序，即它启动、停止、暂停、恢复、处理事件以及处理应用程序之间的通信。 Application Manager 3110 Management runs on the receiver / decoder interactive applications that it start, stop, pause, resume, handles the communication between the event and processing applications. 它允许同时运行多个应用程序，因此涉及在这些应用程序之间分配资源。 It allows multiple applications to run simultaneously, and therefore relates to allocation of resources between these applications. 此应用程序对于用户来说完全是透明的。 For users, this application is completely transparent. .安装程序。  The installer. 安装应用程序3144的目的主要是在第一次使用时配置接收器/解码器。 Install application object 3144 is primarily configured to receive / decoder at the first use. 它执行诸如TV频道扫描、日期和时间设置、用户偏好建立等操作。 It performs TV channel scan, such as the date and time settings, user preferences, establishing and the like operations. 但是，用户可以在任何时候使用安装应用程序来更改接收器/解码器的配置。 However, the user can change the receiver decoder configuration / setup application program at any time. .跳转(Zapping)应用。  The jump (Zapping) applications. 跳转应用程序3146用于利用“上一个节目”、“下一个节目”和数字键来切换频道。 Jump applications 3146 for utilizing "previous program", "next program" and numeric keys to switch channels. 当使用另一种形式的跳转，例如采用导航栏(导航)应用程序时，则终止跳转应用程序。 When using another form of jump, for example, using navigation (navigation) application, the application is terminated jumps. •回叫。  • Callback. 回叫应用程序3148用于提取存储在接收器/解码器存储器中的各种参数值并通过调制解调的反向信道1070 (未显示)或其它方式将这些值返回给商业运营商。 Callback application 3148 is used to extract values ​​of various parameters stored in the receiver / decoder memory through the modem back channel 1070 (not shown) or other means to return these values ​​to the commercial operator. 应用程序层3100中的其它应用程序包括节目指南应用程序3132、每次观看付费应用程序3134、导航栏(导航)应用程序3136、家庭银行应用程序3138、软件下载应用程序3140以及PVR (个人录像器)应用程序3154 (见下面)。  Other applications of the application layer 3100 include a program guide application 3132, pay-per-view application 3134, navigation bar (navigation) application 3136, home banking application 3138, a software download application 3140 and PVR ( personal video recorder) application 3154 (see below). 如上所述，应用程序编程接口(API)层3300包括多个程序包。  As described above, application programming interface (API) layer 3300 comprises a plurality of packages. 它们包括用于例如访问虚拟机的基本功能的基本系统程序包3310、DAVIC程序包3320以及用于访问主要软件供应商所特有的软件体系结构的功能的专用程序包3330。 They include, for example, a basic system program basic functions of the virtual machine to access packet 3310, DAVIC packages 3320, and functional software architecture for the major software vendors access specific proprietary packages 3330. .语言解释器3510。  The language interpreter 3510. 可以安装不同的解释器以与要读取的应用程序类型相符。 Different interpreters can be installed to be read with the application types match. 它们包括Java解释器3512、PanTalk解释器3514、HTML解释器3516、MHEG_5解释器3518及其它解释器。 They include Java interpreter 3512, PanTalk interpreters 3514, HTML interpreters 3516, MHEG_5 interpreter 3518 and the other interpreter. .业务信息(SI)引擎。  The service information (SI) engine. SI引擎3540装入并监控公用数字视频广播(DVB)或节目系统信息协议(PSIP)表，并将它们置于高速缓存内。 3540 SI engine load monitor common Digital Video Broadcasting (DVB) or Program System Information Protocol (the PSIP) table, and places them in the cache. 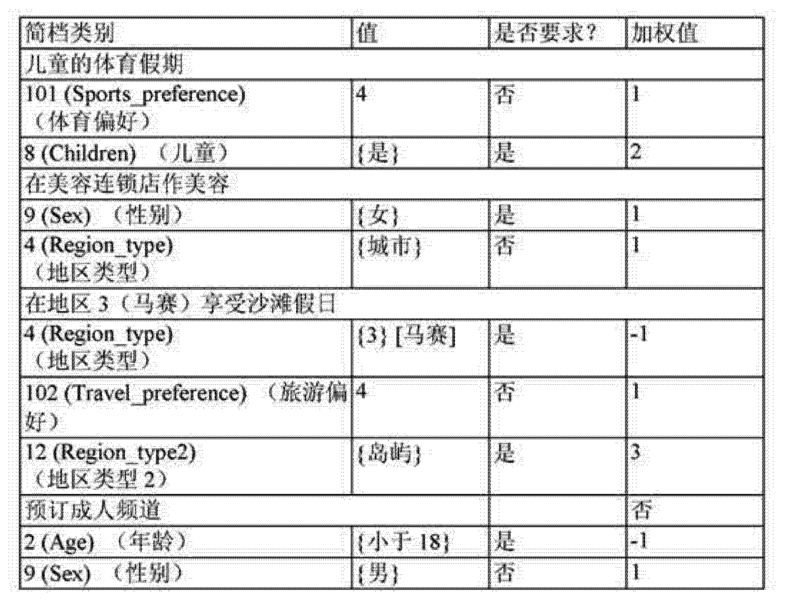 这允许需要这些表中所含数据的应用程序访问它们。 This allows applications that require access to data in these tables are contained. .调度程序3542。  The scheduler 3542. 此模块可实现抢占式多线程调度，其中每个线程具有它自己的事件队列。 This module can achieve preemptive multi-thread scheduling, where each thread has its own event queue. .存储器管理器3544。  The memory manager 3544. 此模块管理对存储器的访问。 This module manages access to memory. 当需要时，它还自动压缩存储器中的数据，以及执行自动垃圾收集。 When necessary, also automatically compresses data in memory, and performs automatic garbage collection. .事件管理器3546。  The event manager 3546. 此模块允许根据优先级触发事件。 This module allows triggering event according to priority. 它管理定时器和事件抓取并允许应用程序彼此发送事件。 It manages timer and event crawl and allows applications to send events to each other. .动态链接器3548。  The dynamic linker 3548. 此模块可解析源自原Java函数的地址，将下载的Java类的原方法装入RAM，以及解决下载的原生代码对ROM的调用。 This module may parse the address of the original Java function from the original method of downloading a Java class loading RAM, and with download native code to call the ROM. .图形系统3550。  The graphics system 3550. 此系统是面向对象且经过优化的。 This system is object-oriented and optimized. 它包括图形窗口和对象的管理，以及具有多语言支持的矢量字体引擎。 It includes graphic window and object management, and vector font engine with multi-language support. .类管理器3552。  The class manager 3552. 此模块装入类和解决任何类引用的问题。 This module load classes and to solve any kind of problem references. .文件系统3554。  The file system 3554. 此模块是小型的且经过优化的，用于管理具有多个ROM、闪速存储器、RAM和DSMCC卷的多层次文件系统。 This module is compact and optimized to manage with a plurality of ROM, flash memory, RAM and DSMCC volumes multi-level file system. 确保闪速存储器的完整性不被任何意外事件破坏。 Ensure the integrity of the flash memory is not destroyed any unexpected event. .安全管理器3556。  The security manager 3556. 此模块对应用程序进行认证，并控制应用程序对敏感存储器和机顶盒的其它区域的访问。 This module authenticates applications and controls the access to other application areas sensitive memory and set-top box. .下载器3558。  downloader 3558. 此模块通过远程DSMCC传送带或通过NFS协议使用自动数据装入，其中下载文件的访问方式与驻留文件的访问方式相同。 This remote DSMCC module using automatic data loading conveyor or through the NFS protocol, wherein the access mode to access the same file and download the file resides. 还提供针对存储器的清除、压缩和认证的功能。 Also provides for a clear memory, compression and authentication features. 此外，支持DAVIC资源通知模型，以便高效管理客户资源。  In addition, support DAVIC resource notification model to efficiently manage customer resources. 内核3650管理虚拟机3500和设备接口层3700 (未显示)中运行的各种不同进程。  Kernel Virtual Machine Management 3650 3500 device interface layer 3700 and the various processes that are running (not shown). 出于效率和可靠性的原因，内核实现了操作系统POSIX标准的相关部分。 For efficiency and reliability reasons, the kernel implements relevant parts of the operating system POSIX standard. 在内核的控制下，虚拟机(运行Java和Pantalk应用程序)在其自己的线程中运行，与操作系统的其它“服务器”部件(如海量存储服务器3850 (未显示))相分开。 , the virtual machine (running Java and Pantalk applications) runs in its own thread under the control of the core, separated from the operating system other "Server" component (such as the mass storage server 3850 (not shown)). 相应的配置如需要将线程ID作为系统调用中的参数来传送也在API层3300中进行，以允许应用程序3120从多线程环境受益。 If desired configuration corresponding to the thread ID as the system call parameters are transmitted for the API layer 3300 to allow the applications 3120 to benefit from the multithreaded environment. 通过提供多线程，可以实现更高的稳定性。  By providing multiple threads, more stability can be achieved. 例如，如果虚拟机3500因某种原因停止工作，如遇到系统崩溃或因应用程序尝试访问设备而被长时间阻塞，则系统其它时间关键的部分，如硬盘服务器可以继续工作。 For example, if a virtual machine 3500 stopped working for some reason, in case of a system crash or due to the application tries to access the device to be blocked for a long time, the key part of the system at other times, such as hard disk server can continue to work. 除虚拟机3500和内核3650，还提供了硬盘录像器(HDVR)模块3850，用于处理硬盘2210或其它附加的海量存储部件的录制和回放功能。  In addition to the virtual machine 3500 and kernel 3650, a hard disk video recorder is also provided (the HDVR) module 3850 for processing recording and playback functions of the hard disk 2210 or other attached mass storage component. 该服务器包括处理录制的两个独立线程3854和3856，一个用于处理回放的线程3858，与海量存储部件接口的文件系统库3852。 The server comprises two separate threads recording processing 3854 and 3856, a file system library for playback processing threads 3858, and 3852 mass storage interface means. 例如，硬盘录像器(HDVR) 3850中线程3854、3856、3858中的合适的一个线程接收来自诸如个人录像(PVR)应用程序3154之类的客户程序的命令(如启动录制特定节目的命令)，以响应用户按下“录像”按钮。  For example, a hard disk video recorder (the HDVR) a suitable thread in the thread 3854,3856,3858 3850 receives commands from a client, such as personal video recording (PVR) application 3154 or the like (e.g., start recording a particular program command) in response to the user pressing the "record" button. 然后，所讨论的线程与服务设备3736 (如图7所示)交互，以设置接收器/解码器中负责处理要录制或回放的比特流的部件并使它们同步。  Then, the service device 3736 and thread question (see Figure 7) interacts in order to set the receiver / decoder which process the bit stream to be recorded part or playback synchronizing them. 该线程还并行地与文件系统库3852进行交互，以协调在硬盘2210 (未显示)上的适当位置进行的录制或回放操作。 The parallel thread also interacts with the file system library 3852 to coordinate the hard disk 2210 (not shown) in place on the recording or playback operation performed. 文件系统库3852然后向海量存储设备3728 (也如图7所示)发送命令，告知海量存储设备2728要(通过FIFO缓冲器)传送哪个子传输流(STS)，且该子传输流应该存储在哪个目标硬盘上。  file system library 3852 then sends commands to the mass storage device 3728 (also shown in Figure 7), to inform the mass storage device 2728 which sub-transport stream (STS) transfer (via a FIFO buffer), and the sub transport stream which should be stored on the target hard disk. 硬盘上簇的分配和通用文件管理由文件系统库3852来执行，海量存储设备本身负责低级操作。 Shangcu distribution of hard disk and file management is performed by the common file system library 3852, a mass storage device itself is responsible for low-level operations. 上述的服务设备3736在这些设备中是唯一的，它不涉及接收器/解码器的某个物理部件。  The service device 3736 is unique in these devices, it does not involve a physical component of the receiver / decoder. 相反，它提供一个高级接口，它将接收器/解码器中的各组调谐器、解复用器、再复用器以及硬盘设备组合在一个“实例”中，从而免除高级进程协调各种子设备的困难。 Instead, it provides a high-level interface, each group will tuner receiver / decoder, a demultiplexer, remultiplexer and hard disk devices in a combination of "example" in eliminating high-level processes coordinating the various sub- difficulties devices. 现在参考图7详细说明接收器/解码器3000的对应于图5下半部分的软件体系结构(包括设备接口层3700、系统软件层和硬件层3900)。  Referring now to Figure 7 details corresponding to the receiver / decoder 3000 in the software architecture of the lower half of FIG. 5 (comprising the device interface layer 3700, the system software layer and a hardware layer 3900). 设备层中所设的其它设备包括条件接收设备3720、对应于图4的两个(或可能更多)调谐器2016和2018的调谐器设备3724、视频设备3734、I/O端口设备3726以及上述的服务设备3736和海量存储设备3728。  Other devices are provided in the device layer comprises a conditional access device 3720, FIG. 4 corresponds to two (or possibly more) tuners 2016 and 2018 of the tuner device 3724, a video device 3734, I / O port device 3726 and above the service device 3736 and mass storage device 3728. 从广义角度讲，设备可以视为定义逻辑接口，以便两个不同的设备可以连接到一个共用物理端口。  In broad perspective, the device can be regarded as defining a logical interface to two different devices can be connected to a common physical port. 某些设备可以在它们之间进行通信，全部设备都在内核3650的控制下工作。 Certain devices may communicate among themselves, all devices are under the control of the core 3650. 在使用任何设备的服务之前，需要将一个程序(如应用程序指令序列)声明为“客户程序”，即至该设备或设备管理器3710的逻辑访问通路。  Before using the services of any device, need to be a program (such as an application instruction sequence) has declared as a "client", that is until the device or the device manager 3710. logical access path. 管理器赋予客户程序一个客户程序号，在对该设备的所有访问中均引用此客户程序号。 The manager gives the client a client number, all access to the device are referenced in this client number. 一个设备可以具有多个客户程序，每个设备的客户程序号是根据设备类型来指定的。 A device may have a plurality of clients, each client device number is specified according to the device type. 客户程序是通过过程“设备:打开通道”来引入设备的。 Client through the process of "Device: Open Channel" to introduce the device. 该过程将客户程序号分配给客户程序。 This process will be client number assigned to the client. 客户程序可以通过过程“设备:关闭通道”而移除设备管理器3710。 The removal of Device Manager 3710: "Off Channel device" client through the process. 对设备管理器3710所提供的设备的访问既可以是同步的也可以是异步的。  Device access to the device manager 3710 can be either provided or may be synchronous or asynchronous. 对于同步访问，使用过程“设备:调用”。 For synchronous access, a procedure "Device: Call." 这是访问立即可获得的数据或访问不涉及等待所需响应的功能的一种方式。 This is a way to access data or functions that do not involve waiting for the desired response of immediate access available. 对于异步访问，使用过程“设备:1/0”。 For asynchronous access, a procedure "Device: 1/0." 这是访问涉及等待响应的数据的一种方式，例如扫描调谐频率以从MPEG流中发现复用或取回表格。 This is a way to access the data related to waiting for a response, for example scanning tuner frequencies to find a multiplex from the MPEG stream or retrieved form. 当请求的结果可用时，则将事件置于引擎的队列中，以指示它的到达。 When the requested result is available, an event is placed in the queue of the engine to indicate its arrival. 另一个过程“设备:事件”提供管理非期望事件的方式。 Another procedure "Device: Event" provides event management undesired way. 在接收器/解码器的第二实施例中，接收器/解码器的下半部分体系结构由图8所示的各层所代替。  In a second embodiment of the receiver / decoder, the lower half of the architecture of the receiver / decoder layers shown in FIG. 8 is replaced. 在此实施例中，在虚拟机3500 (未显示)与设备接口层3700之间设有扩展设备层接口(EDLI) 3600，以及在设备接口层3700与系统软件/硬件层3900之间设有抽象设备接口3800。  In this embodiment, the virtual machine 3500 (not shown) is provided between the device interface layer 3700 (EDLI) 3600, and the interface layer between the expansion device in the device interface layer 3700 and the system software / hardware layer 3900 It features abstract device interface 3800. 其它方面,相同的部件以相同的标号表不。 Other aspects, the same members are not in the same reference numerals. 扩展设备层接口(EDLI) 3600提供虚拟机3500与设备接口层3700之间的专用接口，通常提供对设备接口层的多线程支持。  extended device layer interface (EDLI) 3600 provides a dedicated interface between the virtual machine 3500 and device interface layer 3700, generally provides multithreading support to the device interface layer. EDLI的功能包括将异步事件传送到中间件中适当的线程(因为设备接口层本身不需要支持多线程)以及在各线程之间路由消息。 EDLI functions include transmitting asynchronous events to the appropriate thread in the middleware (since the device interface layer need not itself support multithreading) and routing messages between threads. 抽象设备接口3800提供设备接口层3700与系统软件/硬件层3900的设备驱动程序3910之间的另一个接口。  abstraction device interface 3800 provides an interface between the device interface layer 3700 and the other system software / hardware layer 3900 of the 3910 device driver. 通过提供这种接口，可以使大且复杂的设备层3700在很大程度上与硬件无关。 By providing such an interface can be made large and complex device layer 3700 is largely independent of the hardware. 图6所示的应用程序3120之一是创建和编辑简档的简档管理器。 Application shown in  FIG. 6 is one of 3120 to create and edit a profile manager profile. 简档管理器是驻留的应用程序，它提示最终用户利用遥控器2080输入简档数据。 Profile manager is resident applications, it prompts the end user using the remote controller 2080 input profile data. 简档数据可以包含最终用户所在城市/地区、婚姻状况、年龄或兴趣爱好(例如，指示最终用户对体育、新闻和动作电影感兴趣)。 Profile data can include end-user's city / region, marital status, age or interests (for example, indicates that the final user of sports, action movies and news of interest). 简档数据由简档管理器存储在硬盘驱动器2100中，最终用户随时可以编辑所存储的简档数据。 Profile data from the profile manager stored in the hard disk drive 2100, the end user may edit the stored profile data at any time. 在备选方案中，简档管理器可以通过监控最终用户的观看习惯并相应地设置简档而创建简档。  In the alternative, the profile manager can monitor the viewing habits of the end user and set the profile and create a profile. 例如，简档管理器可能观察到最终用户观看大量体育、新闻和动作电影并记录简档数据，以确保向该用户提供这些类型的节目。 For example, the profile manager may observe a large number of end-users to watch sports, news and action movies and record the profile data, the user is provided to ensure that these types of programs. 在优选实施例的变体中，安装应用程序和其它应用程序和/或中间件的部分充当上述简档管理器的角色。 In a variant embodiment of the preferred embodiment, to install applications and other applications and / or middleware serving as part of the above-described profile manager role. 现在将参考图9至图12 (第一和第二实施例)、图13 (第三实施例)和图14 (第四实施例)说明三种不同类型的“虚拟频道”系统。  Referring now to FIGS. 9 to 12 (first embodiment and second embodiment), FIG. 13 (third embodiment) and Figure 14 (fourth embodiment) illustrate three different types of 'virtual channel' system. 如上所述，在接收器/解码器的用户的控制下，可以将各种类型的节目录制到接收器/解码器内的硬盘中，供以后观看。  As described above, in the user's receiver / decoder control of various types of programs can be recorded to the hard disk within the receiver / decoder for later viewing. 接收器/解码器还可以预先编程，以录制各种特定节目或节目种类，但本质上处理过程仍然是时变操作。 The receiver / decoder may also be programmed in advance to record various specific programs or types of programs, but the process is still essentially a time varying process operation. 图9(a)、(b)、(C)、10、11和12中所示的第一实施例采用硬盘来预先录制多组广告，并将这些广告间插到要向接收器/解码器广播的预定节目之间。  FIG. 9 (a), (b), (C), first embodiment illustrated embodiment employs a hard disk 10, 11 and 12 to a plurality of sets of pre-recorded advertisements, and inserted between the receiver would like these ads between a predetermined program / broadcast decoder. 在图9(a)、(b)和(C)中，相同的部件以相同的标号表不。 In FIG. 9 (a), (b) and (C), the same members are not at the same reference numerals. 参考图9 (a)，其中显示了广播中心1000和接收器/解码器2000，接收器/解码器包括录像电路2250和硬盘2100。  Referring to FIG. 9 (a), which displays the broadcast center 1000 and receiver / decoder 2000, the receiver / decoder 2250 comprises a recording circuit 2100, and a hard disk. 按周期性的预定时间间隔(例如每天凌晨3点到5点的时间，即较少电视频道在广播从而有更多的带宽可用时)，广播中心1000通过广播媒体(通常是电缆或卫星)向接收器/解码器2000传送一系列广告840。 A predetermined periodic intervals of time (e.g., time 3:00 to 5:00 every day, i.e. less television broadcast thus when more bandwidth is available) the broadcast center 1000 via a broadcast medium (cable or satellite typically) to The receiver / decoder 2000 transmits a series of advertisements 840. 接收器/解码器2000则将这些广告存储在硬盘2100上的特殊位置7050。 The receiver / decoder 2000 will position these particular ads stored on hard disk 2100 7050. 广告数据840在一个频道上广播。  The advertisement data 840 is broadcast on a channel. 在广告管理应用程序的管理下，接收器/解码器中的下载机制，如操作通知表(ANT，下面将进行说明)确保调谐器2016和2018之一在预定时隙(本例中为凌晨3点到5点之间)调谐到所需频道，并命令将该数据存储在硬盘2100上。 Under the management of the advertisement management application, download mechanism the receiver / decoder, such as the operation notification table (ANT, which will be described below) to ensure that one of the tuner 2016 and 2018 in a predetermined time slot (in this case 3:00 point to the hard disk 2100 between 5:00) to tune to the desired channel, and stores the data in the command. 可以存储大量的广告(例如50个)。 You can store large amounts of advertising (such as 50). 在优选实施例的变体(以在别处作了更详细的说明)中，通过其它方式来发送广告840，例如，利用诸如因特网或电话连接之类的点到点连接或利用其它广播方式，诸如无线电广播、电缆和卫星链路。  In a variation of the preferred embodiment (made elsewhere in more detail below), the advertisement 840 is transmitted by other means, e.g., using a point to point connections such as the Internet or a telephone connection, or the like using other broadcast mode, such as radio, cable and satellite links. 在优选实施例的另一个变体中，采用其它类型的记录装置，例如模拟录像机或数字录像机来替代硬盘2100。 In another variation of the preferred embodiment, other types of recording apparatus, such as an analog recorder or digital video recorder to replace the hard disk 2100. 参考图9(b)，其中显示不同时间(例如一天中的较晚时间)的广播系统，广播中心1000将节目内容850广播到接收器/解码器2000。  Referring to FIG. 9 (b), showing a different time (e.g. time of day later) broadcasting system, the broadcast center 1000 broadcasts program content 850 to the receiver / decoder 2000. 然后由视频解码电路2250处理该节目内容，并将其在视频输出2040输出，随后在电视机10000 (未显示)上显示。 It is then processed by the video decoding circuit 2250 of the program content, and outputs the video output 2040, subsequently a television 10000 (not shown) on the display. 在预定时间一如开始插播广告时，虚拟频道信息消息(VCIM) 7060 (未显示)插入到节目内容850中并由广告管理应用程序接收。  started at a predetermined time as commercials, the virtual channel information message (VCIM) 7060 (not shown) inserted by the advertisement management application 850 receives the program content. 参考图9(c)，广告管理应用程序于是开始从广告7050的存储池回放一个或多个适合的广告，最好使每个广告的相关目标数据(参见下面)和可选的VCIM中的简档信息(也参见下面)与当前用户所生成且与之相关的简档匹配。  Referring to FIG. 9 (c), and began advertising management application 7050 of the storage pool playback of the one or more ads for ads from, it is preferable that the relevant data for each target advertising (see below) and optionally VCIM the profile information (see also below) are generated and associated with the current user profile match. 现在参考图10来说明虚拟频道信息消息(VCM) 7060的格式。  Referring now to FIG. 10 illustrates the format of the virtual channel information message (VCM) 7060 a. VCM 7060包含首部7070、类别代码7072、调度信息块7074、可选的简档信息7076和可选的签名7078。 VCM 7060 comprises a header 7070, category code 7072, schedule information block 7074, optional profile information 7076, and optional signature 7078. 首部7070包含标识消息类型的幻数(magic number)和消息首部中指定该消息长度的一个字段。 Number of header 7070 (magic number) phantom containing the identification of the message type and a message field that specifies the length of the message header. 类别代码7072标识所需要的节目类型，即广告。 Type of program category code 7072 identifies the need, namely advertising. 调度信息块7074包含多个字段，它们标识诸如所需节目的长度(或更具体地来说是广告插播时间)，可以组合起来达到所需时间长度的节目单元(如单个广告)的最小和最大数量。 Block scheduling information 7074 includes a plurality of fields that identify the desired length of the program, such as (or more specifically, is the commercial break), the smallest program unit can be combined to achieve the desired length of time (e.g., a single ad) and the maximum number. 可选的简档信息7076提供其它的简档信息，以补充、替代用户提供的或单个广告所附带的简档信息或对使其具有倾向性(如上所述)。 The optional profile information 7076 provides further profile information to supplement, replace the profile information provided by the user or a single advertisement or an accompanying tendency (as described above) for it. 如以下更详细的说明所述，每个存储广告或其它节目的适合性是根据如下因素来考虑的:本地用户简档与所存储的广告或其它节目中的目标数据之间的匹配程度，以及其它诸如给定时限内给定广告的重复次数和自接收到广告起所经过的时间等因素。  The more detailed description below, each stored advertisement or other program suitability based on the following factors are considered: a match between the local user profile and target data stored advertisement or other program in degree, and the time and other times as a given ad repeated within a given time from the receipt of advertisements and elapsed factors. 上述的简档信息7076还可实现针对给定用户选择广告的“精细调谐”。  The profile information 7076 also enables the user to select a given ad "fine-tuned" for. 例如，某用户的(以明确选择的或以其它方式推断的)简档暗示其偏好有关体育的节目，则通常会向该用户提供多于饮食相关广告的体育相关广告。 For example, (in order to explicitly selected or otherwise inferred) profile of a user's preferences imply its sports-related programming, it often provides a more sports-related advertising diet-related advertising to users. 但是，例如对于烹饪方面的晚间节目，在开始插播广告时传送的VCIM 7060中的简档信息7076可能会规定对体育的负倾向性以及对饮食的正倾向性，这可能导致意大利面酱的广告先于运动鞋的广告播出。 However, for example, for evening shows on cooking, profile information 7076 VCIM 7060 delivered at the beginning of commercials may specify a negative tendency in sports and the positive tendency of the diet, which can lead to pasta sauce ad first broadcast advertising in sports shoes. 与此相反，在优选实施例的一个变体中，在按计划播放预定节目之前，以“离线”方式整体提供有关调度的信息和个性化广告的其它特征，例如利用预定义节目ID (PID)在预定广播中进行。  In contrast, a variant embodiment of the preferred, before playing a predetermined program schedule, to "off-line" manner to provide other features information and personalized ad scheduling entity, for example using a predefined program ID (PID) in the predetermined broadcast. 或者，当需要个性化广告时，在广播比特流中传送简单的标记消息。 Alternatively, when it is desired personalized ads, simple marker message transmitted in the broadcast bit stream. 在这些实例中，广告或节目的选择不受任何其它的简档信息的影响，因为并没有指定任何其它简档信息。 In these instances, select the ad or program without affecting any other profile information, as any other profile information does not specify. 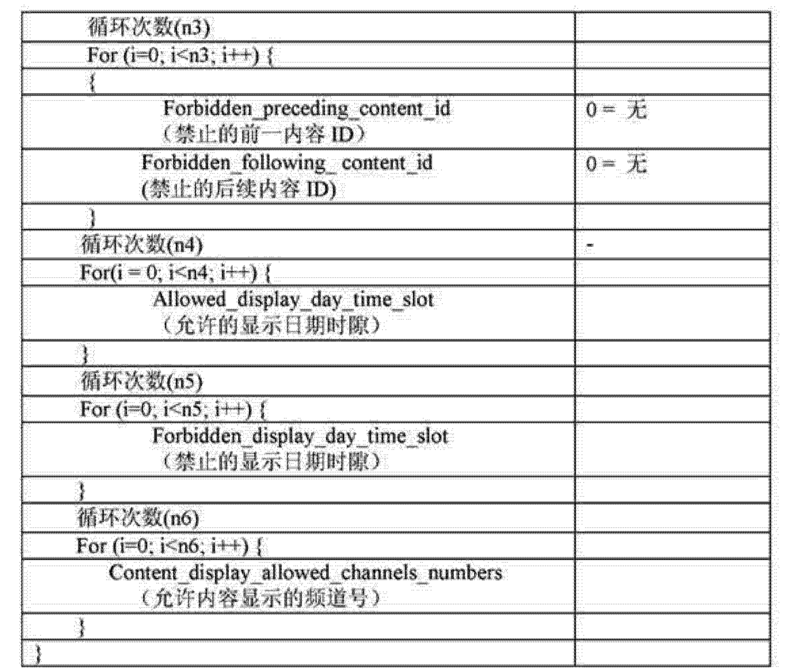 广告数据本身的格式如图11所示。  The advertisement data itself format shown in Figure 11. 随同视频和音频，广告数据还包括目标数据。 Along with video and audio advertising data also includes target data. 例如，图11所示的一组广告数据包括视频分量7002、音频分量7003和目标分量7004。 For example, a set of advertisement data shown in Figure 11 includes a video component 7002, Audio component 7003 and component 7004 target. 目标分量7004指示广告定位于居住在巴黎的单身且对足球感兴趣的最终用户。 7004 indicates the target component targeting end users in single living in Paris and are interested in football. 而下一个广告的目标分量7011指示广告定位于居住在马赛(法国)的已婚且喜爱旅游的最终用户。 The next ad target component of 7011 indicates that the advertising targeted at married living in Marseille (France) and end users love to travel. 为了说明上述原理，图12显示在五个相邻时隙期间呈现给四个不同用户的节目。  To illustrate the above principles, Figure 12 shows presented to four different users during five adjacent time slots in a program. 在第一个时隙期间，广播中心广播电影8000，此电影同时向四个最终用户中的每一个用户播放。 During the first time slot, the broadcast center of Radio, Film 8000, this movie while playing the four end-users in each user. 在电影8000之后的广告时隙期间，驻留在各用户的接收器/解码器2000上的广告管理器将目标数据和硬盘2100上存储的简档数据作比较，并选择符合最终用户简档的广告。 During the ad slot after the movie 8000, advertising manager resides on each user's receiver / decoder 2000 will compare the profile data stored on the hard disk and target data 2100, and chosen for the end-user profile ad. 因此，在图12的实例中，各用户具有不同的简档，因此向他们提供不同的广告8001-8004。 Thus, in the example of FIG. 12, each user has different profiles, thus providing them with different advertisements 8001-8004. 在第三和第四调度时隙期间，向所有用户播放新闻报道8010和连续剧8002。 During the third and fourth slot scheduling, broadcast news reports 8010 and 8002 series to all users. 在插入的广告时隙中，向这四个用户播放不同的广告8011-8014。 Advertising insertion slot, play a different advertisement 8011-8014 to four users. 因为磁盘空间的有限，当广播下一组广告时(例如第二天凌晨3点到5点之间)时，广告管理器可以覆盖任何已经播出的广告，或与所存储的简档不匹配的广告。  Since disk space is limited, when the next set of broadcast advertising time (e.g. the next day between 3:00 to 5:00), Ad Manager may overwrite any advertisements have been aired, or simply stored and file does not match the ad. 在优选实施例中，广告管理应用程序单独提供给虚拟频道管理应用程序。  In a preferred embodiment, the advertisement management application will be provided to the Virtual Channel Manager application. 但是，在优选实施例的变体中，广告管理应用程序构成更为通用的虚拟频道管理应用程序的一部分。 However, in a variant of the preferred embodiment, the Ad Manager application forms a part of a more general Virtual Channel Manager application. 或者，在优选实施例中由两个应用程序同时执行的某些功能改为由其它应用程序(如个人录像(PVR)应用程序3154)来执行。 Alternatively, some features of two embodiments of the application executing at the same time in the preferred embodiment to be performed by other applications (such as personal video recording (PVR) application 3154). 可以创建一个已播放广告的日志记录，并在反向信道连接可用时将其发送回广播中心，以便为任何商业或市场营销目的而处理此类信息。  can create a logging has been playing the advertisement, and a connection is available when it is sent back to the broadcast center, and in order to process such information for any commercial or marketing purposes in the reverse channel. 在优选实施例中，日志记录文件列出了回放的每个广告的内容ID，连同显示它的日期、时间和频道名称。 In a preferred embodiment, the log file lists the content ID of each advertisement playback, displays it together with the date, time and channel name. 下面将详细讨论用户简档、目标数据和简档信息的结构。  The structure discussed in the user profile, target data and profile information detail below. 现在将说明如何提供完全基于和根据存储在接收器/解码器本地的内容生成的虚拟频道或基于不同实况数据流上并行传送的内容的虚拟频道(在本例中的虚拟频道由各数据流的若干部分组成)。  Now will be described how to provide complete and based on (virtual channel in accordance with the present embodiment are each stored in the receiver / decoder of locally generated content based on the virtual channel or virtual channel contents in parallel on different data streams transmitted live portions of the data stream composition). 综合了这两个方面的混合系统也是可能的。 Hybrid system combines these two aspects are possible. 在第二实施例中，利用上述的用于传送和存储广告的相同系统，将节目内容传送到接收器/解码器并存储在海量存储设备如硬盘中。  In the second embodiment, using the same system for the transmission and storage of advertisements, transmitting program content to the receiver / decoder and stored in the mass storage device such as a hard disk. 与重播广告的共同之处在于，虚拟频道依据用户简档来定制节目输出。  and replayed ad in common is that virtual channels based on user profiles to customize the program output. 诸如节目资料的存储和垃圾收集之类的功能也以类似于个性化广告系统的方式工作。 Storage and garbage collection functions such as program material also operate in a manner similar to personalized advertising system. 在优选实施例的变体中，虚拟频道和个性化广告文件处理及其它系统实际基本上组合在一起。 In a variant embodiment of the preferred embodiment, the virtual channel and personalized advertisements file handling and other systems actually substantially together. 但是，与个性化广告相反，个性化内容的回放是连续的且无提示的，且完全在接收器/解码器的控制范围内(当然需要外部控制的情况除外)。  However, contrary to the personalized advertisement, playback of the personalized content is continuous and silent, and is completely within the control range of the receiver / decoder (except of course, require external control). 此外，还需要节目兼容性规则，下面将予以说明。 In addition, the program also requires compatibility rules, as will be explained below. 还可能利用不同的“构造”频道的规则并将实况输出和存储的输出进行组合，根据本地存储的内容构造多于一个的“虚拟频道”。  Rules may also use the output and the live output and storage of different "structure" be combined channel, than a "virtual channel" in accordance with the content of the locally stored configuration. 现在参考图13所示的第三实施例，广播中心1000同时在多个频道上广播预定节目。 The third embodiment, as shown in the broadcast center  Referring now to FIG. 131,000 simultaneously broadcast programs on a plurality of predetermined channels. 在此实例中，广告9000、电影9001、广告9002和体育赛事9003在第一频道上广播；广告9010、新闻报道9011、广告9010、新闻报道9011、广告9012和电影9013在第二频道上广播；广告9020、电影9021、广告9022和电影9023在第三频道上广播。 In this example, the ad 9000, movie 9001, 9003 ad 9002, and sporting events broadcast on the first channel; advertising 9010, news reports 9011, 9010 advertising, news reports 9011, 9013 ad 9012, and movies broadcast on the second channel; Advertising 9020, movie 9021, movie 9023 ad 9022, and broadcast on the third channel. 每个广播的节目包括视频、音频、时间标记和类别分量。  Each broadcast program includes a video, audio, time stamp and category component. 例如，电影9021包括视频元素9030、音频分量9031、时间标记分量9032和类别分量9033。 For example, a 9030 film 9021 including video elements, the audio component of the 9031, 9032 and the time stamp component type component 9033. 时间标记分量9032指示电影9021的持续时间。 Time Stamp component 9032 indicates the duration of the 9021 movie. 类别分量9033指示电影9021的类别(例如动作片)。 Category component 9033 indicates the category of the Movie 9021 (for example, an action movie). 连同上述分量，广告还包括目标数据。 Conjunction with the above components, further comprising advertising target data. 例如，广播9022包含视频分量9040、音频分量9041、时间标记9042和类别分量9043和目标分量9044。 For example, the broadcast video component 9022 comprising 9040, an audio component 9041, Time Stamp component 9042 and Category component 9043 and the 9044 target. 目标分量9044指不广告的目标用户类型。 9044 target component refers to the type of the target user is not advertising. 如上所述，提供了虚拟频道管理应用程序。  As noted above, provides a virtual channel management application. 当启用时，虚拟频道管理应用程序扫描不同的频道，并选择与简档管理器所创建的简档匹配的节目。 When enabled, the profile matching program Virtual Channel Manager application to scan different channels, and select the profile manager you created. 因此在图11的实例中，广告9000可以是汽车广告，其中目标分量指示该广告定位于年龄在30以上的男性用户。 Thus in the example of FIG. 11, the advertisement 9000 may be a car advertisement, wherein the target component indicating that the user targeting men aged 30 or more. 虚拟频道管理器将目标分量与所存储的简档进行比较，因为简档匹配，所以虚拟频道管理器就将调谐器2016调谐到第一频道，并在硬盘2100上以唯一文件名称存储广告9000。 Virtual Channel Manager will target component with a stored profile comparison, because the profile match, so the virtual channel manager tuner will tune to the first channel 2016, and in 2100 with a unique file on the hard disk to store the name of the ad 9000. 在广告9000结束时，虚拟频道管理器扫描各频道，直到它发现具有与所存储的简档匹配的类别和/或目标分量的下一个节目(在本例中为新闻报道9011)的开始位置。 When the ad 9000 end, the virtual channel manager scans each channel until it finds the next program has a category and / or target component with the stored profile matching (as in this case, news reports 9011) starting position. 选择之后，虚拟频道管理器将调谐器2016调谐到第二频道，并将新闻报道存储在硬盘2100上。 After selection, the Virtual Channel Manager tuner 2016 to tune to a second channel on the hard disk storage in 2100 and news reports. 在新闻报道9011结束时，虚拟频道管理器扫描各频道，直到它发现下一个与所存储的简档匹配的节目(在本例中为广告9002)的开始位置。 When news reports end 9011, virtual channel manager scans each channel until it finds the next match with the stored profile program start position (ad 9002 in this case) is. 虚拟频道管理器连续执行此过程(受限于硬盘2100的可用空间)，经过一段时间编辑如下表1所示类型的节目数据库。 Virtual Channel Manager to perform this process continuously (subject to available space on the hard disk 2100), edited over time of the type shown in Table 1 below shows the database. 用户可以在任何时候观看图13所示的广播频道之一，或预先录制的虚拟频道。  The user can view one of a broadcast channel shown in FIG. 13 at any time, or prerecorded virtual channel. 如果用户希望观看虚拟频道，则该用户利用遥控器2080来选择虚拟频道。 If the user wishes to view a virtual channel, the user using the remote control to select a virtual channel 2080. 此时，虚拟频道管理器根据下述各种规则(如特定于应用程序的规则、通用规则和用户自定义规则)运行调度算法。 The Virtual Channel Manager according to the following various rules (e.g., application-specific rules, general rules and user-defined rules) running a scheduling algorithm. 调度算法根据节目数据库编织虚拟频道播放时间表。 Scheduling algorithm weave virtual channel broadcast schedule according to the program database. 下表2中显示了典型节目表的一个实例。 Table 2 below shows a typical example of a program table. 现在参考图14所示的第四实施例，同时在多个频道上广播预定节目。 Predetermined program  Referring now to FIG. 14 in the fourth embodiment, broadcast on multiple channels simultaneously. 在图13所示的实例中，只显示了三个频道，但是通常可以有任意数量的频道。 In the example shown in FIG. 13, only three channels, but in general there may be any number of channels. 电影频道广播以广告9552和9553开始的电影9550和9551。 Movie Channel broadcast advertising 9552 and 9553 and the beginning of the movie 9550 9551. 体育频道广播以广告9562和9563开始的体育赛事9560和9561。 Sports channel broadcast advertising 9562 and 9563 to the beginning of the 9560 sporting events and 9561. 新闻频道广播以广告9572和9573开始的新闻9570和9571。 News channel broadcast news and advertising 9572 9570 and 95,719,573 began. 节目的开始和停止时间如图14的时间tl至t8所示。 Start  FIG program and the stop time t8 to time tl 14 shown in FIG. 图14可与图13对比。 FIG 14 can be compared with FIG. 13. 在图13中，节目的开始和停止时间是不同步的。 In Figure 13, the program start and stop times are not synchronized. 相比之下，在图14中，节目均同时停止和开始。 In contrast, in Figure 14, both programs at the same time to stop and start. 换言之，广告9552、9562、9572分别在时间tl和t2停止和开始，而节目9550、9560、9570在时间t3和t4停止和开始，依此类推。 In other words, advertising 9552,9562,9572 at times tl and t2 stop and start, and the program 9550,9560,9570 at times t3 and t4 stop and start, and so on. 图14所示的广播节目的格式类似于图13所示的格式。 Format  format of a broadcast program similar to FIG. 14 shown in FIG. 13. 但是，在图14的情况中，与各节目相关的控制数据(即时间标记分量、类别分量、目标分量和规则分量)在节目间断期间t2-t3、t4-t5和t6-t7先于视频和音频分量(它们在节目时间tl-t2、t3_t47 t5_t6、t7-t8期间同时广播和显示)广播。 However, in the case of FIG. 14, the control data associated with each program (i.e., the time stamp component, category component, target component and rule component) in the program t2-t3 during the breaks, t4-t5 and t6-t7 prior to video and audio components (tl-t2 at which time the program, t3_t47 t5_t6, t7-t8 period simulcasting and displaying) broadcast. 虚拟频道管理应用程序根据与参考第二实施例所述的调度算法类似的虚拟频道算法在不同的频道之间切换。  Virtual Channel Manager application switches between the different channels according to a second embodiment similar to the embodiment with reference to the virtual channel algorithm for scheduling algorithm. 更具体地来说，在节目间断期间t2-t3，虚拟频道管理应用程序接收与电影9550、体育赛事9560和新闻9570相关的控制数据。 More specifically, during the program break t2-t3, the Virtual Channel Manager application receives control data related to the 9550 movie, sports news 9560 and 9570. 然后，虚拟频道算法根据一组规则分析该控制数据，并确定要选择哪个频道(在本例中为体育频道)。 Then, the virtual channel control algorithm analyzes the data according to a set of rules, and determines which channel to select (in the present embodiment of the sports channel). 因此在图14的实例中，虚拟频道管理器选择在电影频道播出广告9552，随后是在体育频道上播放体育赛事9560，随后又在电影频道上播放广告9553，随后又在新闻频道上播放新闻9571。 Therefore, in the example of Figure 14, the virtual channel manager to select movie channel broadcast advertising in 9552, followed by playing sports on the sports channel in 9560, and later played in the 9553 movie advertising channel, followed by broadcast news on the news channel 9571. 如上所述，用于在多个频道之间进行选择的虚拟频道算法使用了各种规则，包括特定于应用程序的规则、通用规则和用户自定义规则。  As described above, the virtual channel algorithm for selecting between a plurality of channels using a variety of rules, including application-specific rules, general rules and user-defined rules. 这些规则通常可以在节目间断期间从存储设备中检索得到或与控制数据一起接收。 These rules often retrieved or received with the control data from the storage device during the program break. 图13中给出了特定规则的一个实例。 In  Figure 13 shows an example of specific rules. 广告9012包括视频分量9050、音频分量9051、时间标记分量9052、类别分量9053、目标分量9054和规则分量9055。 9050 ad 9012 include a video component, an audio component 9051, Time Stamp component 9052, Category component 9053, the target component 9054 and rules component 9055. 规则分量可以是由广告商指定且与某个特定广告相关的特定于应用程序的规则，如“此广告必须在没有任何其它广告的情况下在广告时隙呈现给用户”。 Rule component may be specified by the advertiser and the rules associated with a particular advertisement application-specific, such as "this ad must be presented to the user in the ad slot in the absence of any other advertising situation." 或者规则分量可以是通用规则，如“在每个电影的前后必须立刻呈现至少一个广告”。 Or rule component may be a general rule, such as "must appear immediately before and after each film at least one ad." 通用规则的其它实例(它们是针对应用程序的或广播中心1000稍后发送的预定义缺省规则)有“电影之后必须播出至少一个广告”;以及“每四个小时的时隙内必须出现至少一次新闻报道”。 Other examples  General rules (which are pre-defined default rules for 1000 later sent an application or broadcast center) has "at least one ad to be aired after the movie"; and "time slot every four hours at least one news "must appear. 广告商指定的特定于应用程序的规则的另一个实例是:“此广告播出两个小时内不可以播放竞争对手的汽车广告”。 Another example of an advertiser specified rules specific to the application is: "This ad aired in two hours can not play rival car advertising." 其它实例包括诸如:“晚上7点到9点之间显示新闻简报”、“晚上8点之后不播出儿童节目”、“晚上10点之前不播出定级为“暴力”的电影、“某些电影不能被观看到一次以上”之类的规则。  Other examples include such as: "Show between 19:00 to 9:00 newsletters", "not children's programs aired after 20:00", "do not broadcast before 10 pm classified as" violent "movies rules "some movies can not be watched more than once to" like. 用户还可以创建虚拟频道回放规则，由简档管理器结合到他们的简档中。  The user can also create virtual channel playback rules, incorporated into their profile by the profile manager. 用户自定义规则的一个实例是，“我希望每部电影之后是体育报道”。 An example of user-defined rules, "I hope that after each film is sports coverage." 某些规则可以利用与节目一起传送的时间分量。  Some rule can use time component transmitted with the program. 例如，通用规则可以规定“任何广告时隙不得超过三分钟”。 For example, the general rule may specify "any advertising slots not more than three minutes." 因此，调度算法可以三个一分钟广告或一个三分钟广告来编排一个广告时隙。 Thus, the scheduling algorithm may three one minute advertisements, or three minute advertisement to an ad slot arrangement. 可以看到，通过简档(影响将什么节目存储到库中)和用户自定义规则(影响调度)，用户对虚拟频道的内容可进行一定程度的控制。  It can be seen by profile (what impact will the program stored in the library) and user-defined rules (affecting schedule), the user of the contents of the virtual channel can be controlled to some extent. 但是，虚拟频道的内容和/或节目表还可以通过特定于应用程序的规则和通用规则来集中控制。 However, the contents of the virtual channel and / or schedule also possible and common rules on applications to centralized control by specific. 如上所述，各种规则同样适用于个性化广告的更为特殊的应用。  As noted above, the rules apply equally to all kinds of personalized advertising more specialized applications. 缺省情况下一组虚拟频道回放规则与虚拟频道管理应用程序一起提供，并将其与应用程序的其余部分一起传送到接收器/解码器(或如果应用程序是通过非广播方式提供的，则以其它方式与应用程序一起提供)。  By default the next set of virtual channel playback rules provided with the Virtual Channel Manager application, and transmitted with the rest of the application to a receiver / decoder (or if the application is provided by way of non-broadcast , places otherwise provided with the application). 这些规则可以是由应用程序的编写者创建的规贝U，也可以是由广告商或其它内容提供商制定的。 These rules can be created by the application of the rules writers Tony U, may also be developed by advertisers or other content providers. 一旦被安装或装入，这些规则就作为虚拟频道管理应用程序的一部分被存储在硬盘2100上。 Once installed or loaded, the rules are part of the Virtual Channel Manager application program is stored on hard disk 2100. 在优选实施例的变体中，这些规则被保存在闪速存储器中(例如为了格外安全和便于携带，将其保存在智能卡上)或普通的RAM中(如果不方便利用海量存储设备或闪速存储器)。 In a variant embodiment of the preferred embodiment, these rules are stored in the flash memory (e.g., for extra security and portability, which is stored on a smart card) or in normal RAM (if not convenient to use mass storage device or flash memory). 缺省规则可以根据从广播中心1000后续下载的信息进行编辑或扩充，例如连同图13所示的节目数据一起传送有关特定的预定节目ID (PID)的新规则。  The default rules may be edited or augmented based on information downloaded from the subsequent broadcast center 1000, for example, along with the program data shown in FIG 13 to transmit new rules on a specific predetermined program ID (PID) together. 如果隐私法禁止广播系统的头端或其它部分从接收器/解码器读取某种(或任何)特定信息，则可以从远程站点完全更新接收器/解码器2000 (未显示)所用规则就特别有用。  If the Privacy Act prohibits the broadcast head-end system or some other portion of the reading (or any) specific information from the receiver / decoder, the receiver may be fully updated from a remote site / decoder 2000 (not shown) used rule is particularly useful. 例如，能够随时并关于任何特定时间、用户、接收器/解码器、节目或频道来传送新的规贝U，则实施指定的广告或节目编排策略就无需广播者直接干预。 For example, at any time and for any particular time, user, receiver / decoder, program or channel to deliver new regulatory Tony U, the implementation of specific advertising or programming strategy eliminates the need for direct intervention broadcaster. 在优选实施例中，通用的MPEG “专用”表用于将规则传送给接收器/解码器2000。  embodiment, the MPEG universal "private" table for delivery rules to the receiver / decoder 2000 in the preferred embodiment. 此类型的表在以本申请人名义申请的欧洲专利申请N0.01306315.1中有详细描述，该申请的内容通过参考结合于本文中。 This type of table is described in detail in European Patent Application N0.01306315.1 name of the present Applicant, the contents of which are hereby incorporated by reference herein. 下面将说明这些表的管理和结构以及如何将其用于传送规则和内容到接收器/解码器。  Next will be explained the management and structure of these tables and how rules and for conveying the content to the receiver / decoder. 为了解释下面的通用表结构，提供了一个作为机顶盒的操作软件的一部分的语法分析程序。  In order to explain the general structure of the table below, a parser is provided as part of the operating software of the set top box. 在给定数据结构下构造此类语法分析程序可以很容易地由本专业人员来完成，因此这里只概述一些基本要求。 Such configuration parser can be easily done by those skilled in the given data structure, only some basic requirements outlined here. 包括语法分析程序的语法分析层在应用程序层与MPEG表接收和过滤层之间提供一个抽象层，它提取广播中心通过节目流发送的信息。  comprising a parser parsing layer between the application layer and the MPEG table reception and filtering layer provides an abstraction layer, which extracts information transmitted from the broadcast center via the program stream. 这种抽象的效果在于，不同应用程序不必为它们所处理的不同种类的数据而专门加以调整以适合于处理大量不同的表格格式。  effect of this abstraction is that the different applications do not have different types of data they process specially adapted to be adjusted to handle a large number of different table formats. 语法分析程序处理接收到的表段(tablesection)，并提取相关信息，之后将其传递给应用程序层的应用程序，例如上述的广告管理器。 The parser processes the received table sections (tablesection), and extract the relevant information, then pass it to the application layer of the application, such as the aforementioned advertising manager. 下面所述的通用表格式允许用相同表结构组织不同类型的数据。  The following generic table format allows different types of data organized using the same table structure. 存储在表段中作为通用和特定属性描述符集合的单个单个的数据项包含应用程序所需的信息。 Stored as a generic and specific attribute descriptors single set of individual data items contain the information needed in the application table section. 描述符的格式可能有所不同；在上述实例中，将包含指定信息类型和大小属性的标志的简单首部提供给语法分析程序，以使其能够正确地提取信息并传递给应用程序。 Descriptor formats may vary; in the above example, a simple header containing flag information specifying the type and size of the property provided to the parser, so that it is possible to correctly extract the information and pass to the application. 此外，描述符列表的大小是以Common_Descriptor_info_length字段和Extra_Identifier_descriptor_length字段的形式提供的，以便使语法分析程序可以正确地提取它们。  Further, descriptor list size field and form Common_Descriptor_info_length Extra_Identifier_descriptor_length fields provided, so that the parser can correctly extract them. 语法分析程序本身无需考虑各数据项的意义或功能；它只将数据传递给应用程序。 Parser itself without regard to the meaning or function of each data item; it only passes the data to the application. 因此语法分析程序无需知道它可能接收到的不同类型的信息；而由应用程序来执行信息的解释。 Therefore parser do not need to know the different types of information it might receive; and to explain the execution of information by the application. 语法分析程序只剥离首部中所含的与传输相关的信息，并将表的实际数据内容以合适的通用形式传递给应用程序。 Parser release only information contained in the transmission header and the actual data contents of the table transmitted in a suitable form to a general-purpose application. 因此，语法分析程序可以处理可变长度的不同类型的表。 Thus, the parser can handle different types of tables of variable length. 语法分析程序的设计只受通用目的表的设计约束，而不受不同应用程序所用的不同类型的信息约束。 Design parser only by the design constraints general-purpose table, without being bound by different types of information used by different applications. 为了允许其它的表段格式，当前格式提供了语法分析格式字段(Data_Parsing_Format)。  In order to allow for further table section formats, the current format provides a parse format field (Data_Parsing_Format). 在所有表格式中，此字段前的首部的大小保持不变，以便语法分析程序可以正确地识别该字段，该字段用于确定专用表段的格式，并因此选择合适的策略来对它进行分析。 In all the table format, the size of the header before this field remains unchanged, so that the parser can correctly identify the field, which determines the format for private table section and thus choose the appropriate strategy to analyze it . 在本例中，表3显示用于向接收器/解码器传递广告顺序规则的高级表结构(“虚拟频道管理表”VCMT)。  In the present example, Table 3 shows the table structure for the delivery of advertisements Advanced sequencing rules to the receiver / decoder ( "Virtual Channel Management Table" VCMT). 可以看到，此格式基本是通用的，适于其它应用，如下面所述的操作通知表(ANT)。 Can be seen, this format is essentially generic and suitable for other applications, as described below in Table operation notification (ANT). 这些单位是数字视频广播(DVB)标准上下文中众所周知的缩略语；例如，Uimsbf表示无符号整数(最高有效位优先(Most Significant Bit First)),而Bslbf表示位串(左边位优先(Left Bit First))。  These units are Digital Video Broadcasting (DVB) standard abbreviations well known in the context; for example, Uimsbf unsigned integer (MSB first (Most Significant Bit First)), and the bit string representing Bslbf (left bit first ( Left Bit First)). data_parsing_format设置在将来的版本中数据格式发生变化的情况下为通用表语法分析程序提供帮助。  data_parsing_format help set common table parser in the event of a change in future releases data format. data_parsing_format值模256提供表格式版本号。 data_parsing_format tabular value modulo 256 provides a version number. 优先级设置取根据与专用数据相关的优先级取四个值之一(O是最高优先级，而3是最低优先级)。  take priority setting takes one of four values ​​according to a priority associated with the private data (O is the highest priority, while the lowest priority is 3). data_parsing_format_flag 是根据data_parsing_format 值定义的。  data_parsing_format_flag data_parsing_format is a defined value. extra_identif ier_length 设置用于定义extra_identif ier 字段，而extra_identifier字段又是描述以下描述符循环的标识符或标识符集。  extra_identif ier_length extra_identif ier is provided for defining the fields, while the following description is extra_identifier field descriptor loop of the set of identifiers or identifier. 现在将说明操作通知表(ANT)，即表3所给通用MPEG结构的一个应用。  Operation will now be described notification table (ANT), i.e. Table 3, a generic MPEG structure given application. 操作通知表(ANT)基于先前讨论的类型的通用表结构。  Operation notification table (ANT) based on the type of generic table structure previously discussed. 它可以用于指令机顶盒或一组机顶盒执行特定操作。 It can be a set of instructions for a set top box or set-top box to perform certain operations. 由接收器/解码器执行的操作实例包括下载软件；自动频道扫描；重启接收器/解码器；刷新节目目录(如视频点播目录);以及向机顶盒的用户显示消息(观众消息)。  operation example performed by the receiver / decoder comprises a downloading software; automatic channel scanning; restart the receiver / decoder; refresh program contents (such as video-on-demand catalog); and a message (viewer message) displayed to a user set top box. 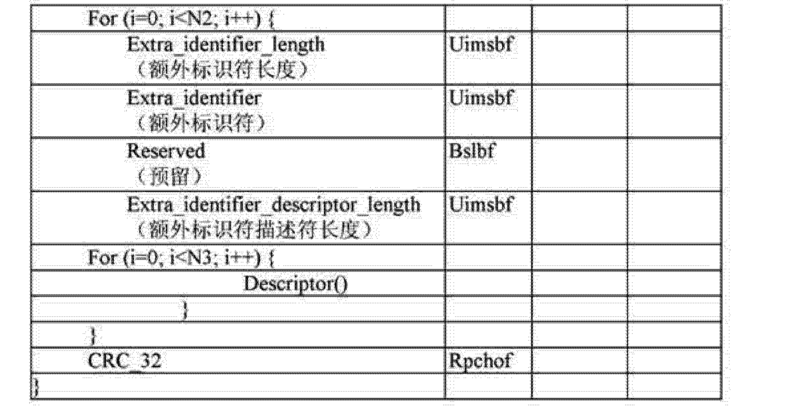 表1D扩展字段用于ANT中标识所需操作。 Table 1D extension field is used to identify the desired action ANT. 通过目标描述符，可使ANT针对特定种类(例如来自某个特定制造商)的机顶盒中或甚至单个机顶盒。  by the object descriptor, for a particular species can ANT (e.g., from a particular manufacturer) or even a set top box in a single set-top box. 可以将这些描述符设置在例如ANT表的通用描述符循环中。 These descriptors may be provided, for example, a general description of the ANT table descriptor loop. 通过处理通用描述符循环中的目标描述符，机顶盒可以判断操作是否要由它来执行。 By the processing object descriptors in the common descriptor loop, the set-top box may determine whether the operation to be performed by it. 例如，目标和操作信息的处理可以由运行于机顶盒上的应用程序来执行。 For example, the target information and the processing operation may be performed by an application running on set-top box. 下表 4 说明scheduled_content_download_descriptor (预定内容下载描述符)数据结构，它用于将有关内容下载预定的特定信息传送到硬盘上。 Table 4 illustrates scheduled_content_download_descriptor (predetermined content download descriptor) data structure  of which the contents of the messages related to the predetermined specific information downloaded to the hard disk. 此描述符构成基于表3所示通用数据结构的操作通知表(ANT)的一部分。 This constitutes a part descriptor based on the table shown in Table 3 operation notification generic data structure (ANT) is. 上述的预定下载设置允许通过编程以周期性方式进行自动内容下载(例如连续一个月，每天凌晨3点进行一次)，直到操作成功为止。  The arrangement allows downloading of predetermined content download automatically by programming in a periodic manner (e.g. for a month, once a day, 3:00), until the operation succeeds. periodicity设置定义接收器/解码器在按预定操作开始下载过程时的动作。  periodicity setting defines the operation of the receiver / decoder when the download process according to a predetermined operation. 此periodicity 仅在介于预定操作的UTC_date_time_start 与UTC_date_time_estimated_stop值之间时才有效。 This periodicity is only valid when a predetermined operation is interposed between the UTC_date_time_estimated_stop UTC_date_time_start value. UTC_date_time_start设置给出内容下载的预定日期和时间。  UTC_date_time_start setting a predetermined date and time given content download. 它用UTC (通用时间代码)格式编码，与DVB标准在TDT表和TOT表中指定的格式相同。 It uses UTC (Universal Time Code) encoding format, as specified in the DVB standard in the TDT and TOT tables table format. UTC_date_time_estimated_stop设置指示基于估计的下载持续时间的代码下载的有效日期。  UTC_date_time_estimated_stop setting indicates the expiration date based Codes estimated download duration of. 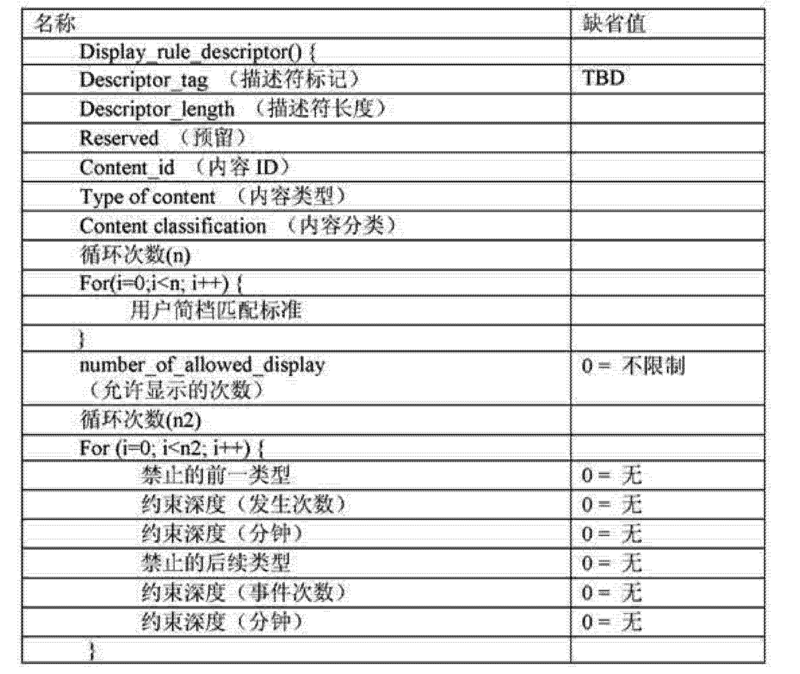 下表5说明display_rule_descriptor (显示规则描述符)的结构,它还与图3的通用表配合使用，其中包含有关应用于特定节目的规则的信息。 Description 5  The following table structure display_rule_descriptor (show rules Descriptor), also used in conjunction with the universal table in FIG. 3, which contains information about the rules that apply to a particular program. 在上述实例中，从可以指定的不同参数的个数(禁止的前一内容ID、允许的日期时隙等)，可以看出规则的灵活度。  In the above example, the number (forbidden preceding content ID, allowed date slots, etc.) may specify different parameters can be seen that the flexibility of the rules. scheduled_content_download_descriptor (表4)和display_rule_descriptor(表5)都与Content_id值所唯一标识的单个内容片段有关。  scheduled_content_download_descriptor (Table 4) and display_rule_descriptor (Table 5) are associated with a single content segment Content_id value uniquely identified. 应该记住，上述的VCMT表和对应的描述符仅是示例。  It should be remembered, VCMT above table and corresponding descriptors are merely exemplary. 其它描述符和其它传送规则的方式也是可能的，如更特定于应用程序的消息和表。 Other descriptors, and other ways delivery rules are possible, such as more application-specific messages and tables. 在优选实施例的变体中，虚拟频道信息消息(VCIM)和/或个性化广告的其它方面以及虚拟频道系统由上述类型的MPEG表所取代。  In a variation of the preferred embodiment, the Virtual Channel Information Message (VCIM) and / or other aspects of the personalized advertisements and virtual channel systems are replaced by MPEG tables of the type described above. 对本专业人员来说，对上述表进行必要的修改并不很困难，因此这里不作进一步详细说明。 Professionals of this, the above-mentioned table is not necessary to modify it is difficult, and therefore will not be further described in detail. 此外，使用上述的语法分析程序则无需对相关应用程序作较多更改以便可与新表配合使用。 In addition, using the parser so that you do not need to make many changes can be used with the new table to the relevant application. 现在将更详细地说明简档数据的格式。  will now be profile data format described in detail. 为了协助操作用户简档，定义了一定数量的不同的简档类别，每种类别具有唯一的编号、对应的名称/标记以及可能的值集合。  The user profile defines the different profiles of a number of categories, each category has a unique ID, name / tag, and set of possible values ​​corresponding to assist the operator. 在某些情况中，可能的值基本是布尔型的(是/否)，而在另一些情况中，可能的值对应于有限的数值范围(如X个偏好类别)。 In some cases, it may be a value substantially boolean (yes / no), while in other cases, the possible values ​​correspond to a limited range of values ​​(e.g., the X preference categories). 但是在各种情况中，简档类别都可以表示为无符号整数(类似于C语言中的enum (枚举)类型)。 But in each case, the profile category can be represented as an unsigned integer (similar to the C language enum (enumeration) type). 表6中给出了一组典型的类别。  Table 6 shows a typical set of categories. 简档管理器维护一个包含每个所选简档类别的表。  Table selected category each profile maintains a profile manager contains. 可以通过来自广播中心和/或常规软件下载的特殊消息添加或删除类别。 You can add or remove categories by special messages from the broadcast center and / or conventional software downloads. 类别还可以个别地由用户浏览并设置；例如，对于各种XXX_preferenCe类别，可以调整滑动条，从I至5或“非常不喜欢”到“非常喜欢”等(对应于O至4的实际值)。 Class may also be individually set by the user and the browser; for example, for various categories XXX_preferenCe, sliders can be adjusted from I to 5, or "do not like" to "very much" and the like (corresponding to the actual value of O to 4) . 可以看到，这些类别可以在两类类型之间变化，第一类如宠物、子女等，理想情况下它们可以仅由用户来设置(利用简档管理器直接设置、或通过响应用户提交给广播者的信息而从广播中心发送的消息以间接方式设置)设置的类别；另一类如XXX_preferenCe类别等，它们可以通过观察用户的观看习惯来设置。  can be seen, these categories may vary between two types, the first type such as pets, children, etc., they can ideally only be set by the user (using the profile manager directly, or in response to user information submitted to the broadcaster and indirect manner category) provided from the message sent by the broadcast center; XXX_preferenCe as another category, etc., which can be set by observing the user's viewing habits. 其它类别，如国家和地区/国家类别可以由广播中心、接收器/解码器或其它实体根据预订用户标识号(通常特定于地区)或其它标识符(如传输ID、有线网络子网、IP地址范围、路由器ID等)来设置。 Other categories, such as national and regional / national category may be made of the broadcast center, receiver / decoder or other entity on a subscription user identification number (usually specific to a region), or other identifier (e.g., transmission ID, cable network subnet, IP address, range, router ID, etc.) is set. 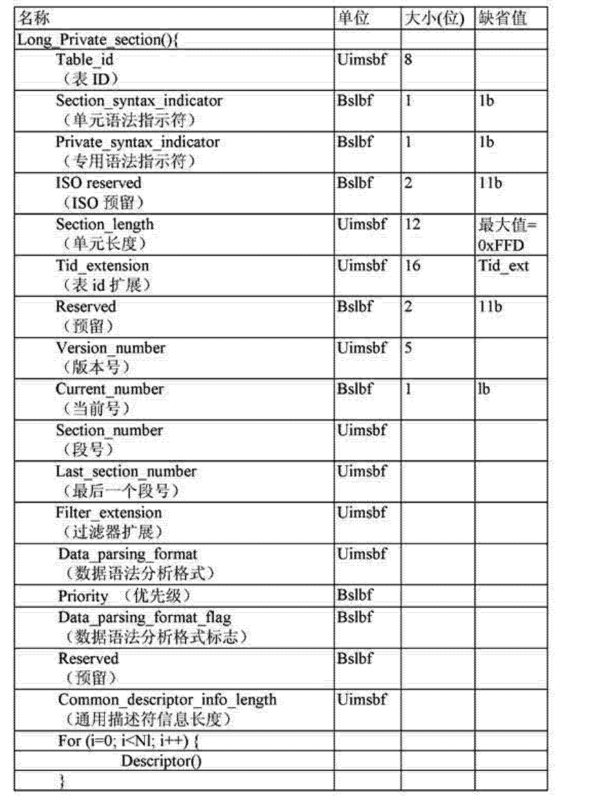 表7中给出了目标数据结构的详细说明。  Table 7 gives a detailed description of the structure of object data. 从上面可以看到，提供了值、加权值和强制性标志，以允许更灵活的定制。  can be seen from the above, a value of the weighting values ​​and mandatory flag, in order to allow more flexible customization. 加权值-1 (最好配合强制性标准)表示应该避免给定值，而非与之匹配。 Weighting value 1 (preferably with a mandatory criteria) indicates the given value should be avoided, rather than matched. 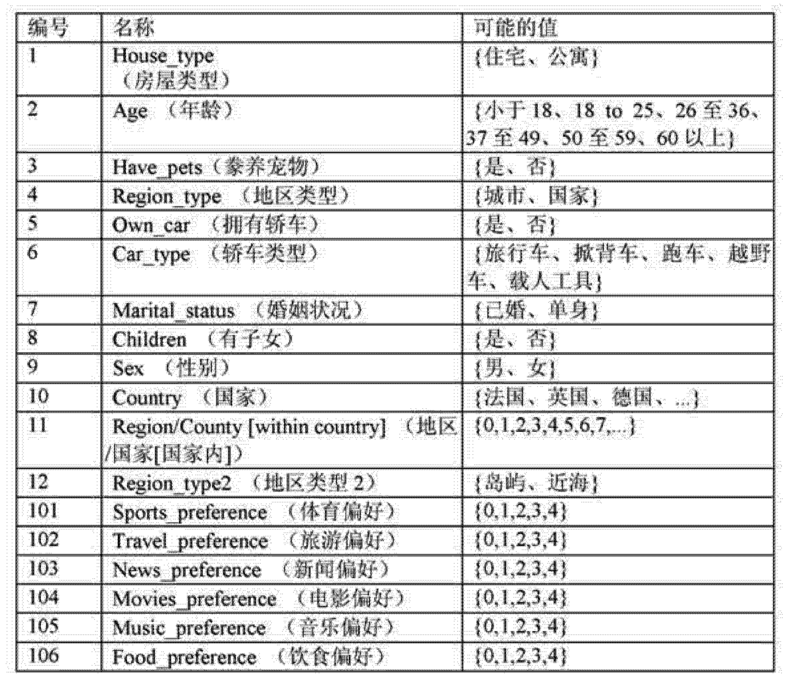 表8给出(在VCM中传送的)简档信息的多个实例。  Table 8 shows examples of a plurality of profile information (transmitted in the VCM). 简档类别值标识要修改的类别，加权值(如果有的话)指示要作用于用户简档(通常为XXX_preferenCe简档类别)的调整。  profile category value identifies the category to modify, the weighting value (if any) to be applied to indicate the user profile (typically XXX_preferenCe profile categories) adjustment. 条件字段非常灵活，在优选实施例中，它被编码为包含要被赋值的表达式的字符串。 Field conditions very flexible, in the preferred embodiment, it is encoded as an expression of the character string to be assigned. 图15显示用于评估广告的适合性的系统。  FIG. 15 shows a system for evaluating the suitability of advertisements. 最初，在步骤9600重设current_advertisement (当前广告)循环计数器变量。 Initially, at step 9600 to reset current_advertisement (current ad) loop counter variable. 在步骤9602,检查当前广告(由current_advertisement确定)是否满足必需的标准,包括检查是否满足所有的强制性目标属性。 In step 9602, it checks the current advertisement (determined by the current_advertisement) meets the necessary criteria, including checking whether all of the mandatory target attributes meet. 其它标准还可以包括确保在给定时间期间内未重复播出该广告。 Other criteria may include ensuring the advertisement broadcast is not repeated in a given period of time. 在步骤9604 (假定广告满足所述标准)，计算该广告的得分，并将其存储在临时数组中。  (assuming advertisement satisfies the criterion) in a step 9604, the ad score is calculated and stored in a temporary array. 在步骤9606,使current_advertisement变量递增，并在步骤9608进行检测。 In step 9606, the variable is incremented so current_advertisement, detected at step 9608. 在步骤9610的循环结束时，检查得分数组，并选择得分最高的广告(它还满足必要的标准)。 At the end of the cycle in step 9610, an array of inspection score, and select the highest-scoring ad (also meets the necessary criteria). 图16更详细地显示计算某个特定广告的得分的步骤。  Figure 16 shows in more detail the step of scoring a particular ad is calculated. 在步骤9700，重设total_weight (总加权)、score (得分)和cur-attribute变量。 In step 9700, reset total_weight (total weight), Score (points) and variable cur-attribute. 首先在步骤9702测试当前属性的加权。 First, in step 9702 the current test weighted attributes. 如果它是负值一即如果指定了被禁止的值一则忽略该属性，然后退出循环(跳到步骤9716)。 I.e., if it is a negative value if a specified prohibited attribute is ignored, and loop is exited (skip to step 9716). 在步骤9704，按适合的值使总加权值递增。 In step 9704, according to a suitable value so that the total weight value is incremented. 从后续步骤可以看出，算法被设计为使得分的范围在O与I之间。 As can be seen from the subsequent steps, the algorithm is designed such that the range between the points O and I. 在步骤9706，计算各种中间变量(在本例中为了方便说明后续的步骤)；cur_category 变量被设为当前属性的类别(如101, Sports_preference),而cur_usr_profile被设为当前用户简档中类别的实际值。  In step 9706, calculates various intermediate variables (in the present embodiment for convenience of explanation in the subsequent step); cur_category variable is set to the current category attribute (e.g., 101, Sports_preference), and is set to the current cur_usr_profile user profile the actual value category. 在步骤9708，测试类别的类型，以便对具有一定数值范围的类别(如Sports_preference、Music_preference等)使用更复杂的得分算法(步骤9714)，该算法将简档值与目标值的一致程度或不一致程度纳入考虑。 In the type of test categories step 9708, in order, the algorithm will not match the extent of the degree of coincidence or category (e.g. Sports_preference, Music_preference, etc.) using a more complex scoring algorithm (step 9714) having a range of values ​​of the target value profile into account. 在步骤9710，只对简单类别作较为简单的测试，以便如果值一致，则按适当的加权系数使得分值递增(步骤9712);如果值不一致,则不变。 In step 9710, only for simple category simpler test, so that if the values ​​agree, that press the appropriate weighting coefficient value is incremented (step 9712); if the values ​​do not match, will remain unchanged. 在步骤9716和9718,使循环计数器(cur_attribute)递增，然后对其进行测试。 At step 9716 and 9718, loop counter (cur_attribute) is incremented, and then test it. 最后，在步骤9720计算总的加权得分。 Finally, at step 9720 calculates the total weighted scores. 此系统未将VCM中提供的附加简档信息纳入考虑，但是可以考虑按照上述处理流程进行修改(对步骤9712和9714)。  This system is not additional profile information provided in the VCM into account, but may be modified in consideration of the above-described processing flow (step 9712 and 9714). 另外还可以构造其它不同复杂程度的用于匹配简档数据的系统。 It may additionally also be configured for various other systems to match the complexity of the profile data. 实现上述各种功能的精确细节以及它们在硬件和软件之间的分配是实现者的选择问题，这里不作详细描述。  precise details of the various functions described above, and their distribution between hardware and software is the implementor's choice, not described in detail here. 但是，应注意，可以执行接收器/解码器中所需操作的专用集成电路可以在市面上购得，或者可以容易地设计出来，因此它们可以用作硬件加速器的基础，最好将其修改以得到专用硬件加速器，用以实现各种所需的操作，从而降低运行软件所需的处理能力。 However, it is noted, it may perform application specific integrated circuit receiver / decoder may be required for operation are commercially available, or can be readily designed so they can be used as the basis for a hardware accelerator, which is preferably modified to to give dedicated hardware accelerator, to implement various operations required, thereby reducing the processing power required to run the software. 但是，如果有足够的处理能力，也可以软件方式实现所需操作。 However, if there is enough processing power, you can achieve the desired operating software. 上面已经从各部件所提供的特征和功能的角度以及可选的和优选的特征的角度，对各模块及其它部件作了说明。  From the perspective of above has features and functions provided by each component and optional and preferred features, and descriptions of the other components of the modules. 利用所提供的信息和说明书，这些特征和精确细节的具体实现可留给实现者。 And using the information provided herein, these features and the precise details of the specific implementation may be left to the implementor. 例如，某个模块可以用软件来实现，最好使用C编程语言来实现，并且最好进行编译以在用于运行应用程序的处理器上运行；但是，一些部件可以在不同的处理器上运行，一些或全部部件可以通过专用硬件来实现。 For example, a module may be implemented in software, preferably implemented using the C programming language and preferably compiled to run on the processor used to run the application; however, some components may be run on different processors Some or all of the components may be realized by dedicated hardware. 上述模块和部件仅是说明性的，本发明可以各种方式来实现，具体地来说，某个部件可以与执行类似功能的其它部件组合，或者可以在简化的实施方案中省略某些部件。  The modules and components are merely illustrative, and the present invention can be implemented in various ways, specifically, some components may be other combinations of components performing similar functions, or some may be omitted in a simplified embodiment of the embodiment these components. 各个功能的硬件和软件实现方案可以在多个部件之间以及单个部件内随意组合。 The hardware and software functions of each embodiment can be freely implemented in combination in a single member and an inner member between the plurality. 容易理解，硬件和计算机软件等执行的功能是基于或利用电子及类似信号来执行的。  readily understood that the functions performed by computer hardware and software or the like is based on the use of electronic signals and the like to be executed. 软件实现方案可以存储在ROM或闪速存储器中。 Software implementations may be stored in ROM or flash memory. 应理解，以上完全是通过实例来说明本发明的，在本发明的范围内可以对细节进行修改。  understood that the above described invention solely by way of example, and modifications of detail can be made within the scope of the present invention. 说明书和(必要时)权利要求书和附图中所公开的每个特征可以单独提供或以任何适当的组合方式提供。  specification, and (if necessary) the claims and drawings Each feature disclosed herein may be provided separately or in any suitable combination of requirements. 权利要求书中出现的参考标号仅用作说明，对权利要求书的范围没有任何限制作用。 The book  Reference numerals appearing claim for illustration only, without any limiting effect on the scope of the appended claims. 1.在数字电视系统中的接收器/解码器(200)，包括: 用于接收多个广播频道的装置(2012，2014，2016，2018)，每个频道包括多个节目，所接收的节目包括广告和/或新闻报道； 用于存储多个接收的节目的装置； 用于从所述多个存储的节目中选择第一存储的节目以用于输出的装置(2002)； 用于存储节目顺序规则的装置； 其中所述选择装置响应于在广播消息中的标识待选择用于输出的存储的节目的类别的标识符以及指示待选择用于在一时隙期间输出的存储的节目的最小数量和最大数量的标识符，所述广播消息由接收器/解码器接收并且指示至少一个存储的节目必须被选择来在所述时隙期间输出，并且其中所述选择装置将所述节目顺序规则应用于对第一存储的节目的所述选择，所述节目顺序规则限制所述最小数量和最大数量。 1. The digital television receiver system / decoder (200), comprising: means for broadcasting a plurality of channels (2012,2014,2016,2018) receiver, each channel comprising a plurality of programs, the received program including advertising, and / or news reports; means for storing a plurality of programs received; means for selecting a first program from said stored plurality of stored programs to the output means (2002); for storing program order of the rules means; wherein said category selecting means responsive to the stored identifier in the broadcast message is to be selected for output of the program identifier indicating the selected program to be stored during a time slot for the output of the minimum number of and the maximum number identifier, the broadcast message received by the receiver / decoder and indicating at least one stored program must be selected for output during the time slot, and wherein said selecting means to said program sequence rules applied first memory to the selection of a program, the program sequence rules limit the minimum and maximum number. 2.如权利要求1所述的接收器/解码器，还包括用于创建所选择的存储的节目的日志文件的装置。 2. A receiver / decoder according to claim 1, further comprising a log file of the program means for creating a selected memory. 3.如权利要求1所述的接收器/解码器，还包括用于存储至少一个用户简档的装置，其中所述选择装置适于根据所述至少一个用户简档和与所述多个存储的节目相关联的控制数据选择第一存储的节目，所述控制数据包括所述第一存储的节目的简档数据，所述第一存储的节目的选择通过使简档数据与用户简档匹配来进行。 3. A receiver / decoder according to claim 1, further comprising means for storing at least one user profile, wherein said selecting means is adapted to said at least one user profile and said plurality of storing control data associated with the selected program is a first program memory, said control data comprising profile data stored in the first program, the first program selected by the stored profile data and user profile matching to carry out.